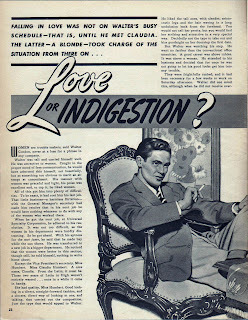 This was originally written as a short obituary for Roy Thomas' ALTER EGO Magazine. 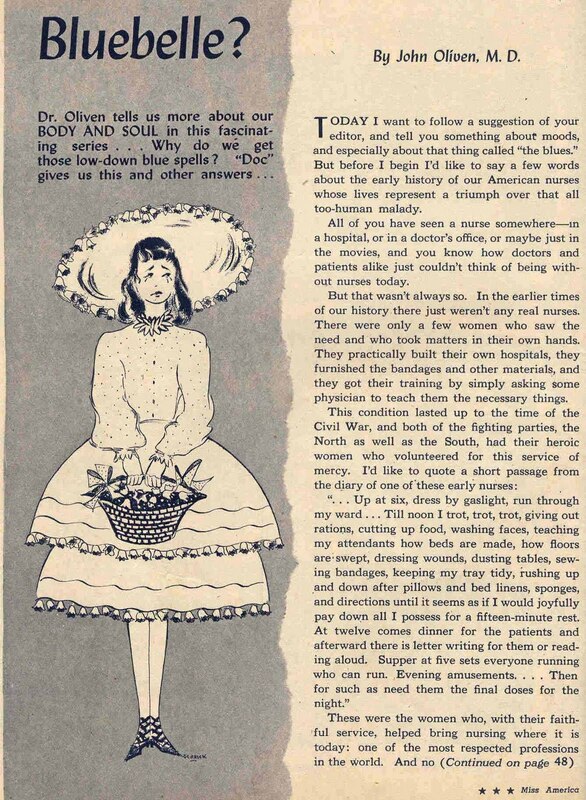 I then decided to expand it into a career spanning Timely article to cover her comic book work in much more deserved detail, detail that a short printed obituary could not provide. With the generous help of her family, I was able to turn up numerous examples of Miss Altson's non-comic industry work. As time goes on, I will update this post with additional images, so check in frequently. 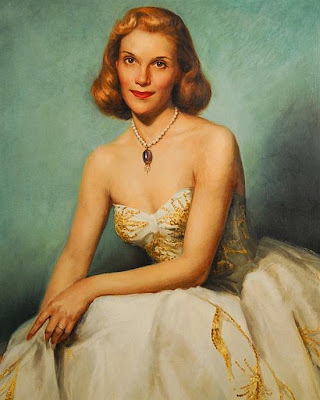 I want to start with the somewhat cropped portrait below painted in 1953 of Pauline Robin Bush, the three year old daughter of future president George Bush and his wife Barbara. 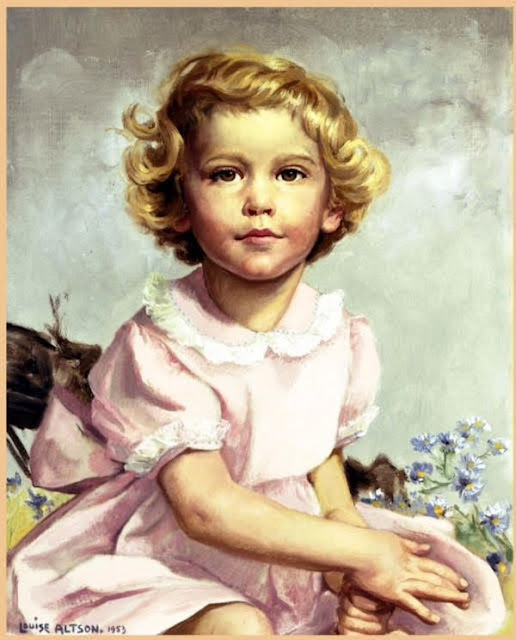 Known affectionately as "Robin", this beautiful child would sadly die of leukemia on October 11, 1953, just 2 months shy of her 4th birthday. 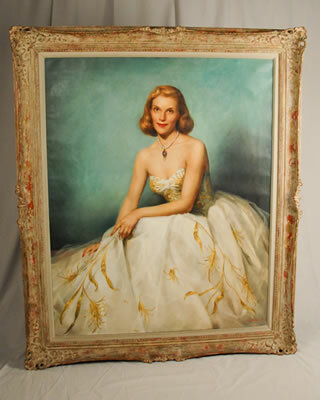 Miss Atlson told the Palm Beach Post on July 25, 1987, "That's the one portrait I painted with tears" (2). The painting hangs in the George Bush Presidential Library at Texas A&M University. Faith, along with family, were the most important elements in the long life and artistic career of Louise Altson. She frequently used her children and family members as models in her work, and received inspiration from her faith throughout her life. 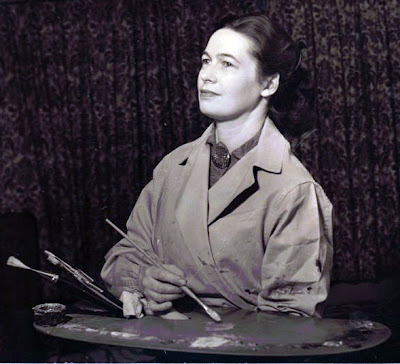 Several times she rendered magnificent biblical-themed paintings for the churches she attended living in different parts of the country. 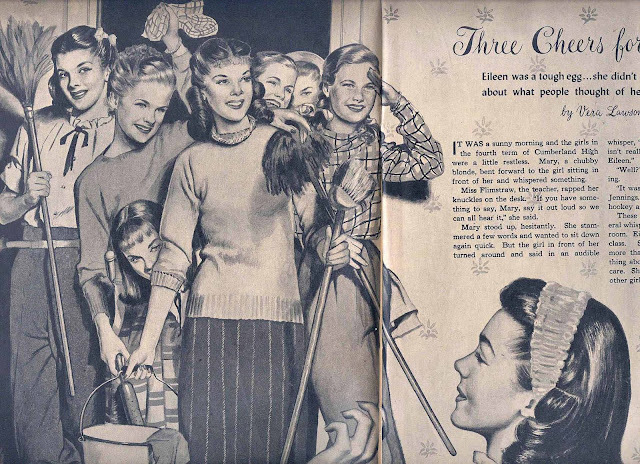 In 1953 her work titled "The First Vigil" was commissioned and hung in the chapel of the Community Church of Douglaston, on Long Island in New York, where Louise and her husband lived starting in 1950. 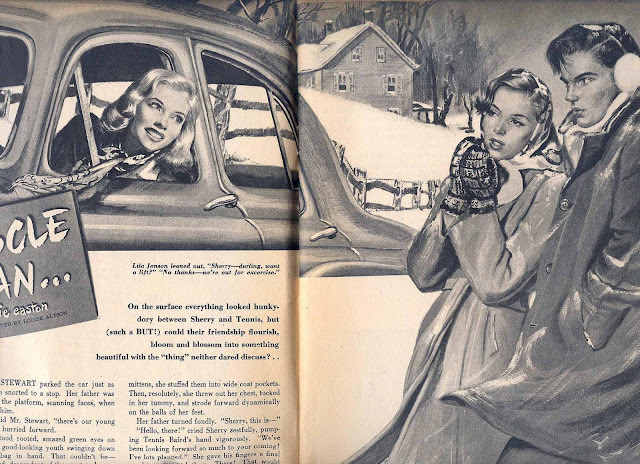 This painting was featured on the cover of the New York Sunday News for December 20, 1953. 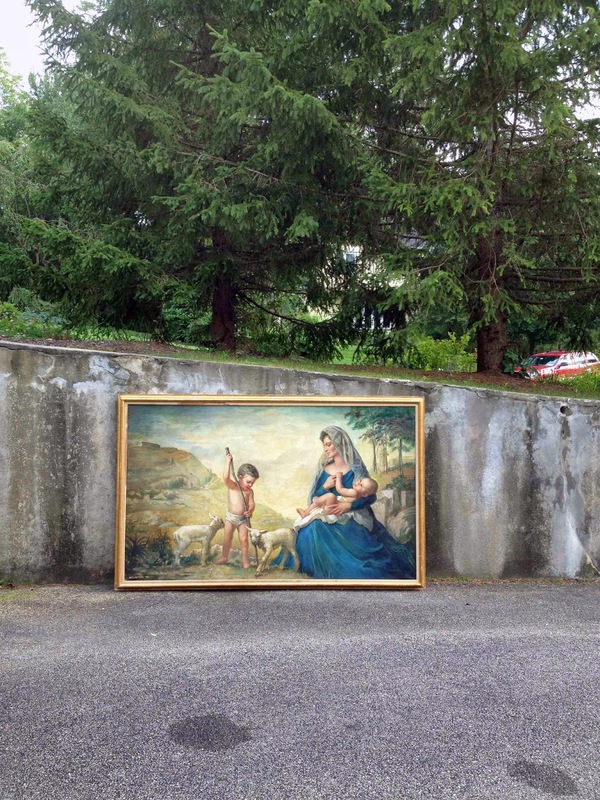 Last week I finally tracked down the painting, still hanging in the chapel of the church. 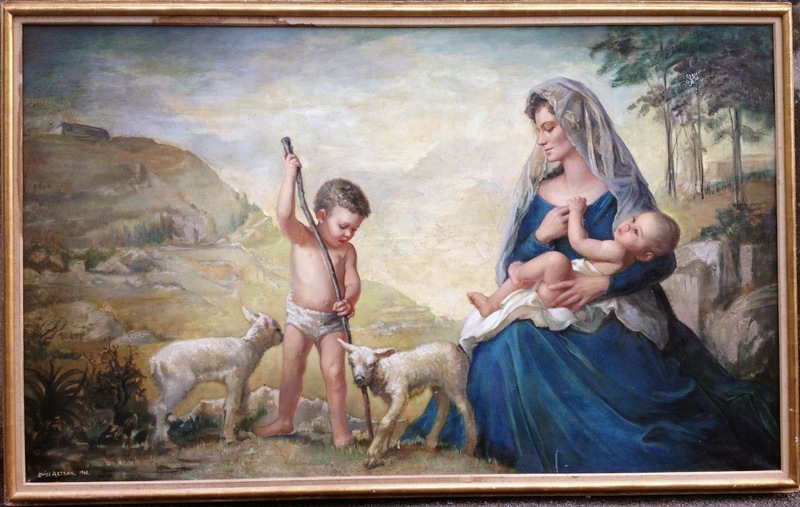 The current pastor, Adrienne Hausch, told me the original pastor at the time of the painting's completion was her grandfather, and that she'd grown up with the image, seeing it daily for 58 years. When possible, I'll have images of that painting up here. 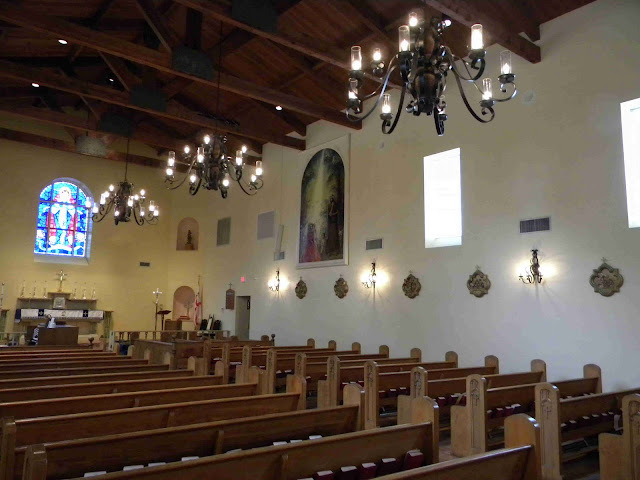 Recently I was contacted by Father Erich A. Zwingert, the rector of St. Mary the Virgin Anglican Church in Delray Beach, Florida, who presided over Louise Altson's funeral in march of 2010. 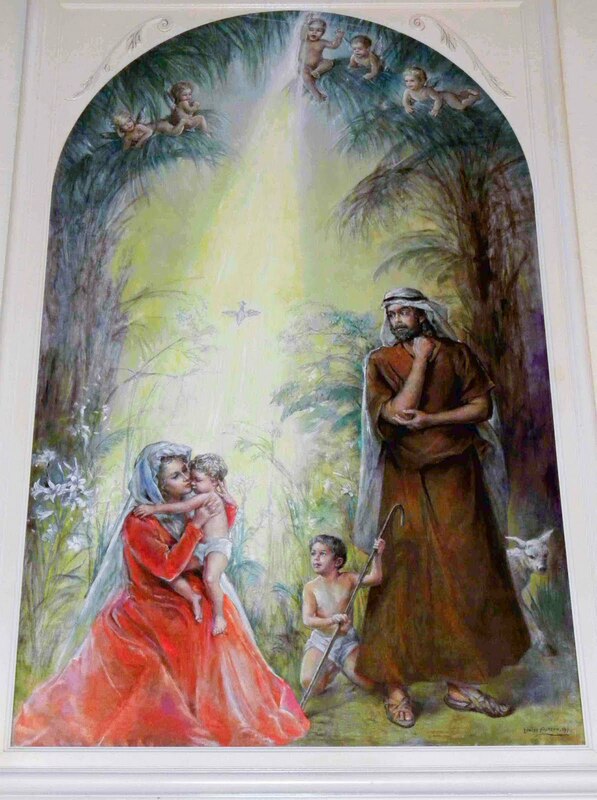 Father Zwingert sent me photos of another painting that hangs in his church, one of the last major works of art Louise Altson rendered, a large image of the Holy Family 15 feet tall by 7 feet wide, hanging in the nave of the church she attended from 1989 until her death in 2010. The painting was begun in the early 1980's and completed in 1991. 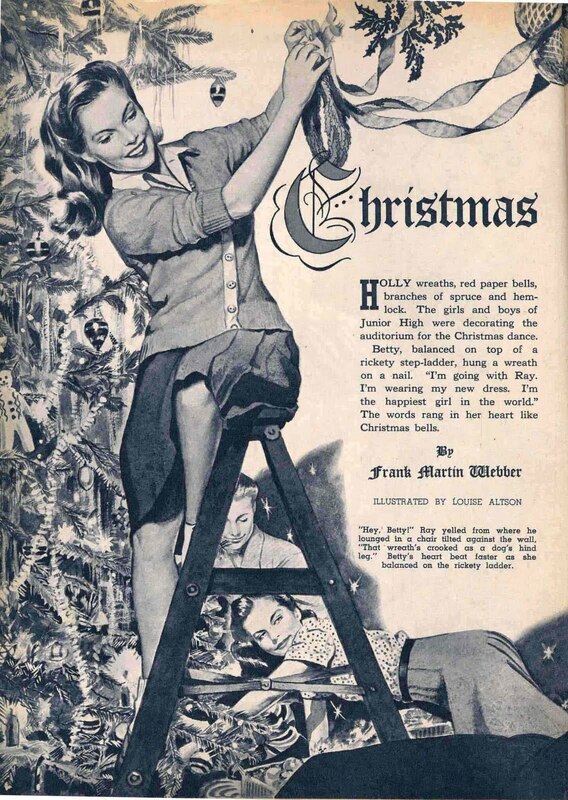 Louise's daughter Jean was the model for Mary, her late husband the model for Joseph and her son Travis the model for the baby Jesus. 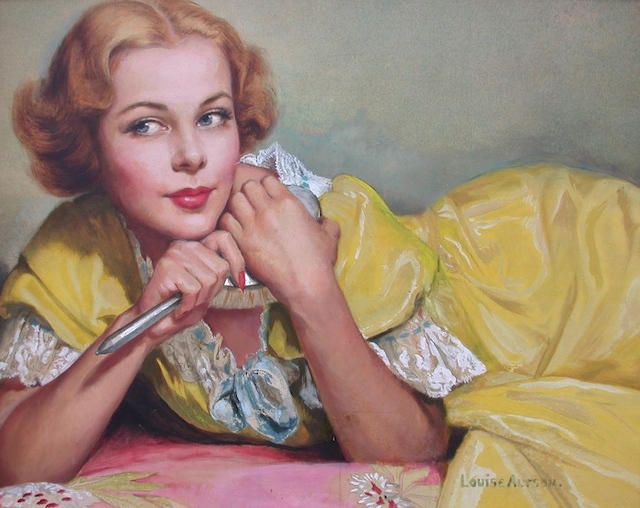 According to Father Zwingert, Louise partly worked on this painting on her hands and knees. 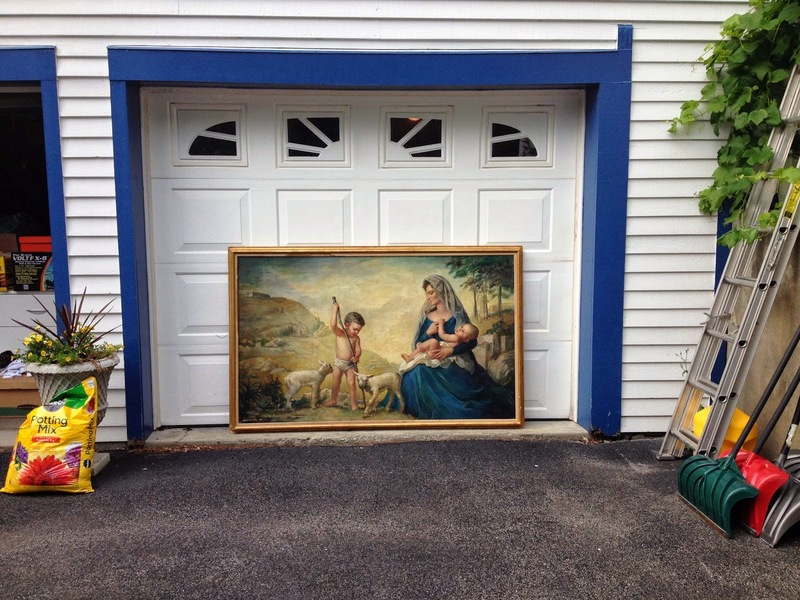 Louise Altson - "The Holy Family"
I recently had the enormous pleasure to acquire a never seen painting by Louise Altson, painted for the chapel of St. Mary's in Peekskill, New York (in Westchester County) in 1965. This large work measures 4 by 6 feet and is just stunning in person. 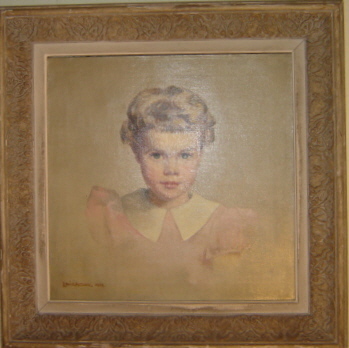 Other paintings I've acquired by Louise over the years. 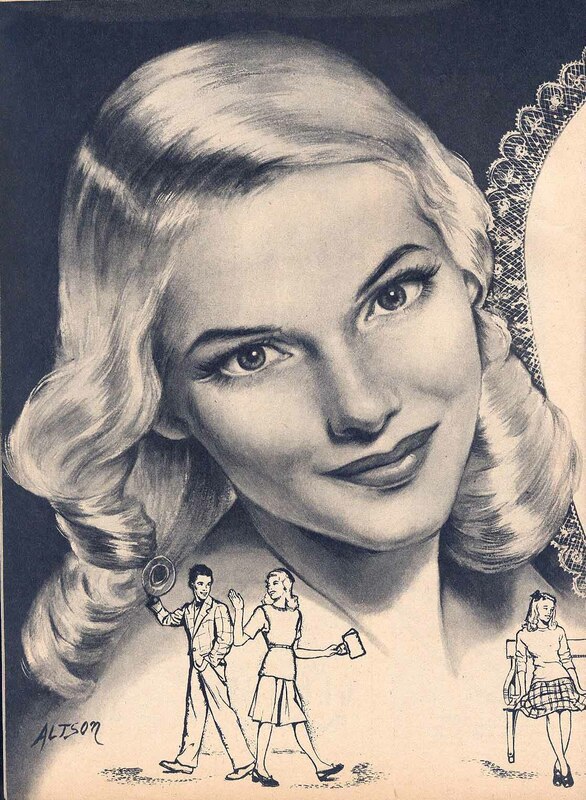 The woman subject below is unknown to me. 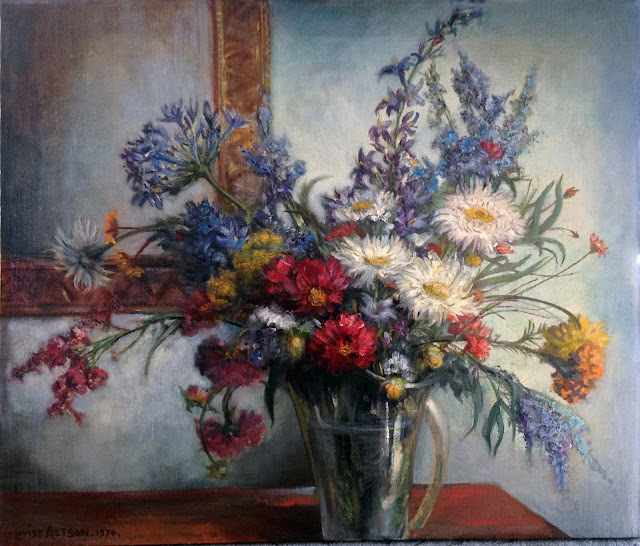 This still life flower painting is just gorgeous in person! Here are additional painting examples. In 1946 Louise began working for the Toronto Star Weekly newspaper. 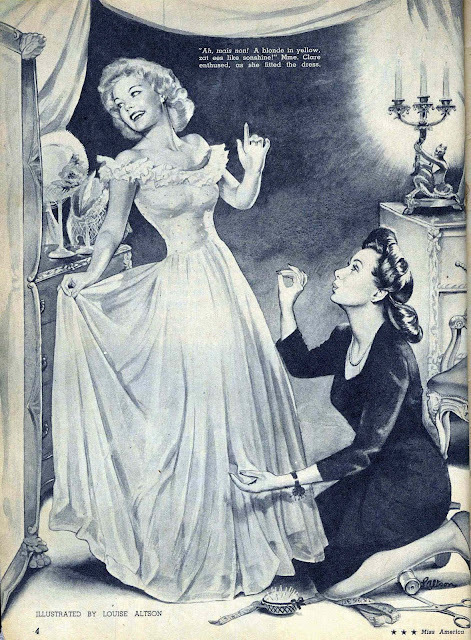 Their woman's section carried a fiction short story and Miss Altson did the illustrations accompanying the text. She did approximately 40 installments and at least 2 Christmas covers. 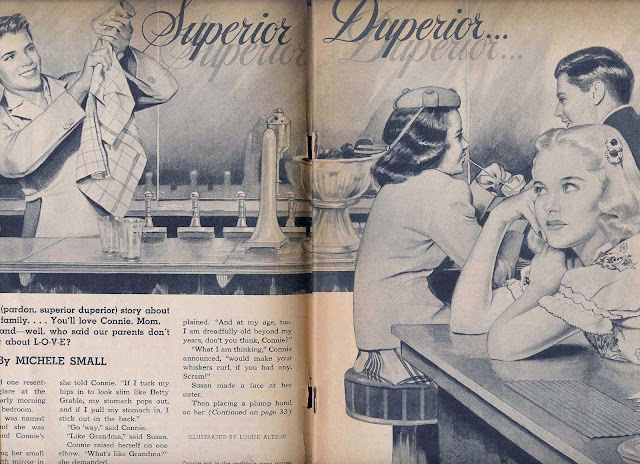 Here below is a clipping of one of the newspaper entries from May 22, 1950 and the original painting below that. 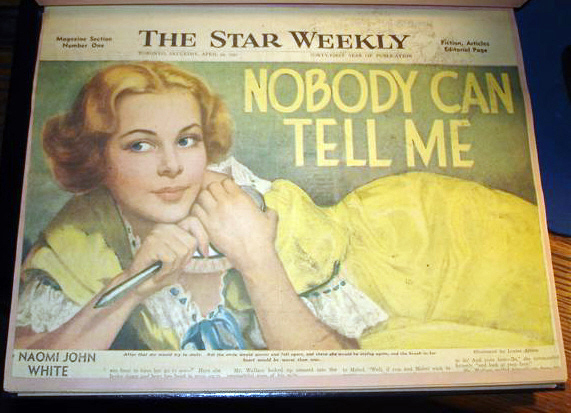 The Toronto Star Weekly clipping was supplied by daughter-in-law Carol Altson. 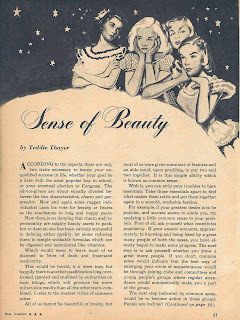 A gorgeous work! 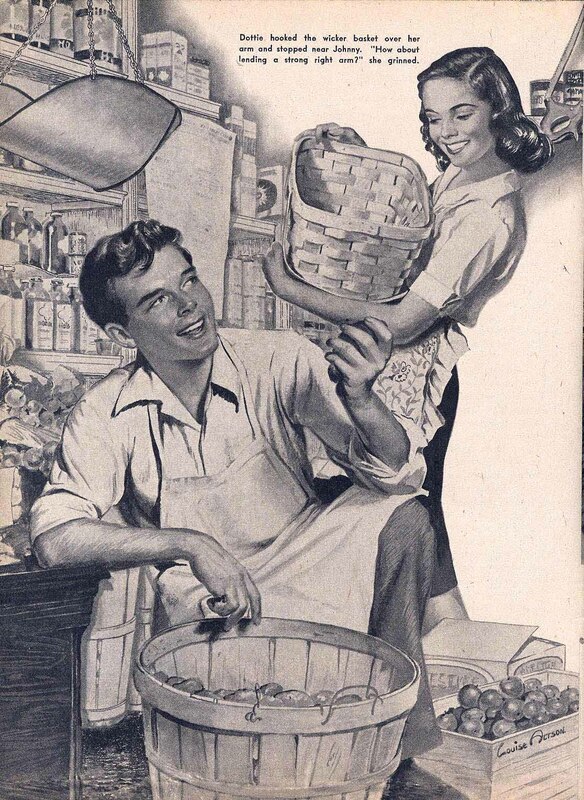 I wish I had access to the entire uncropped image to display here! Louise also worked for a while in commercial art. 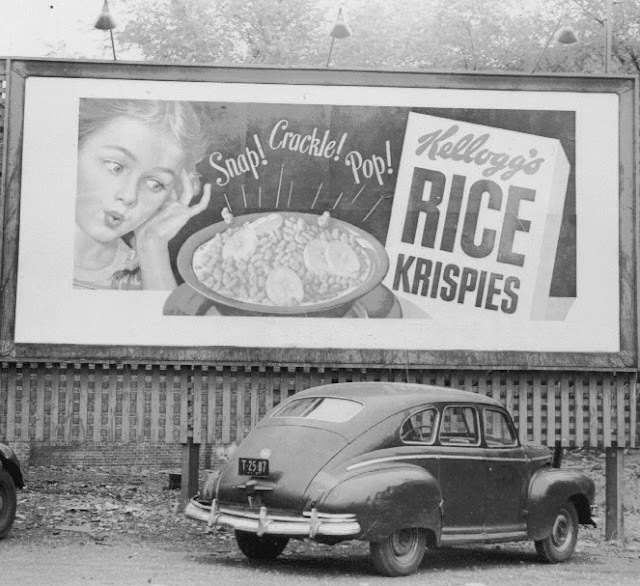 Here from the 1940's is a Kellogg's Rice Krispies advertisement that was blown up onto a billboard. 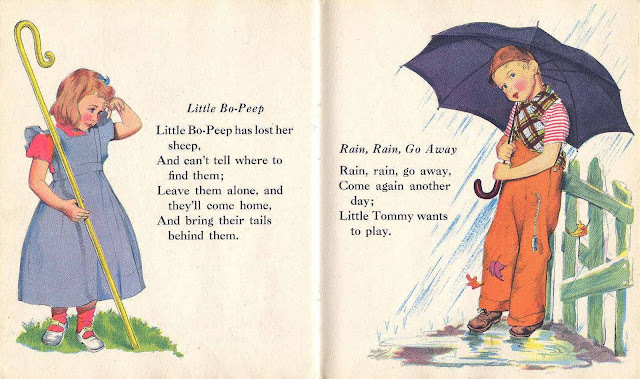 Louise Altson began her career by illustrating children's books and magazines. 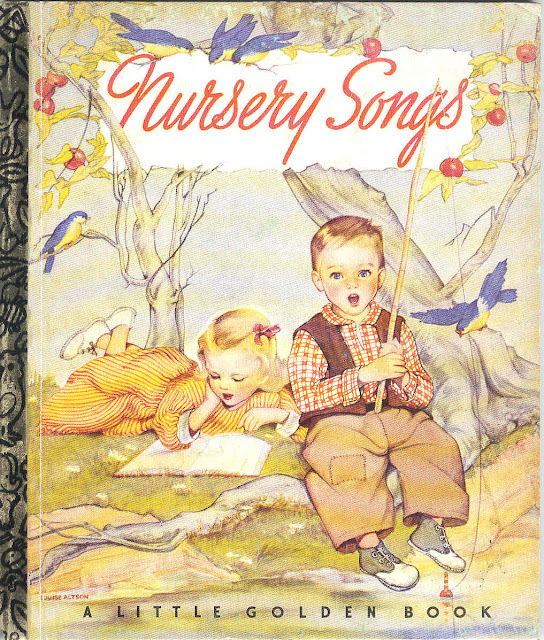 One of her accounts was Little Golden Books where she painted the cover to NURSERY SONGS, one of the initial twelve releases in the long-running series that debuted in September of 1942. The interior art was by Corinne Malvern. 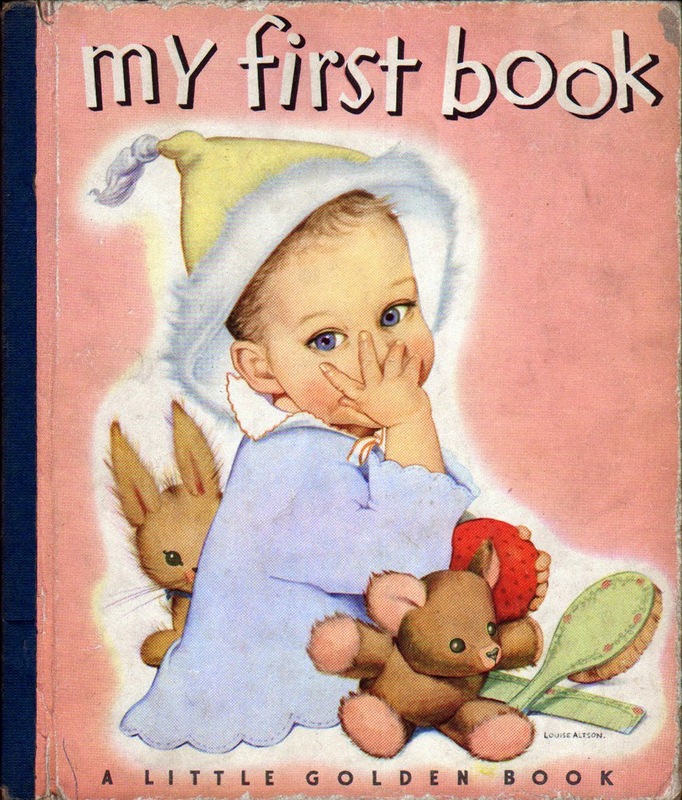 A second Little Golden Book where she only painted the cover, was "My First Book", published also in 1942. 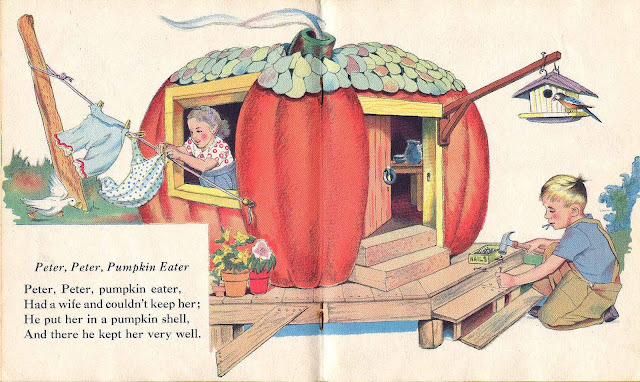 Altson also illustrated NURSERY RHYMES (cover and interior) for Whitman's Tell-A-Tale Book line in 1945. Here is the cover and I've included 3 double pages as examples below. 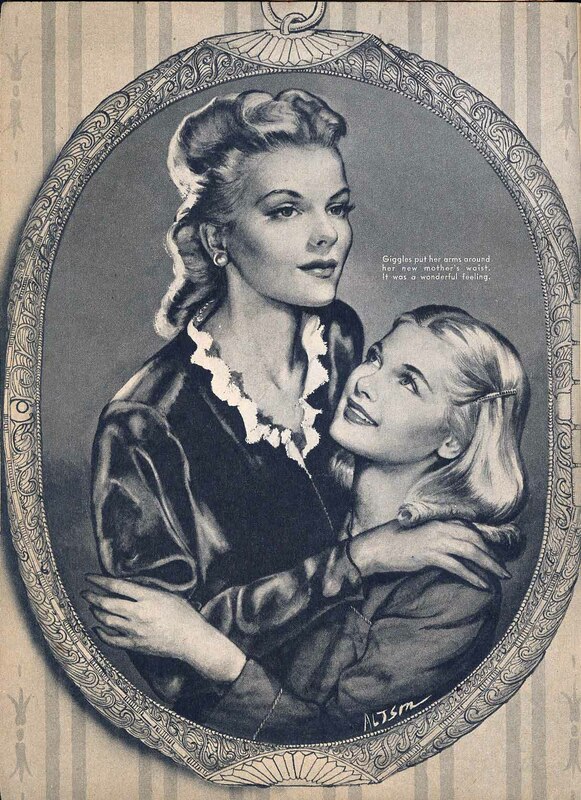 By 1944, Louise Altson showed up at Timely Comics in the Jean Goodman supervised, Bessie Little edited, teen girl's magazine MISS AMERICA MAGAZINE. 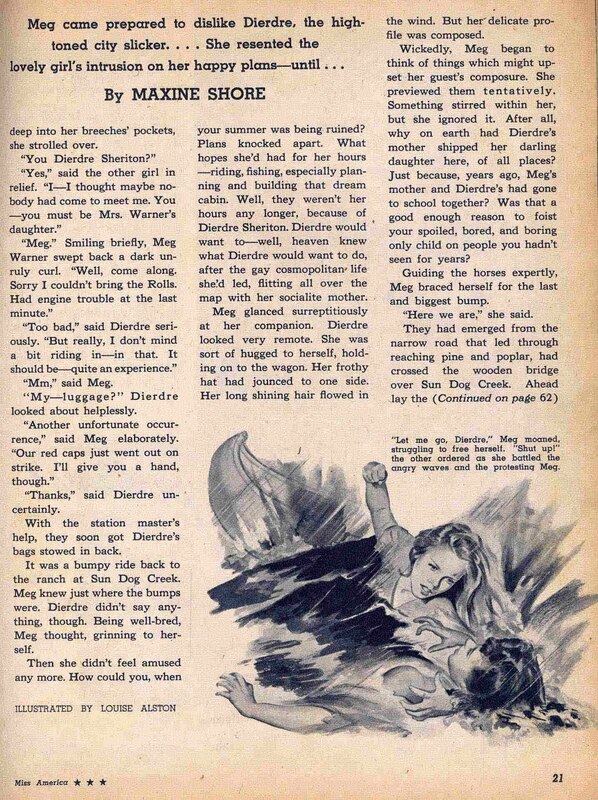 Here she illustrated fiction text story splashes in a beautiful, photo-realistic style (including the Dec/44 cover). 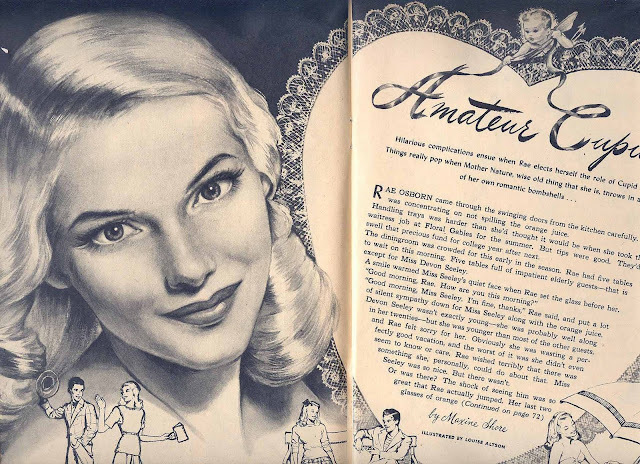 Altson would continue contributing to MISS AMERICA into 1947 and then in 1949 branch out as a cover painter on teen and romance comic books like JUNIOR MISS, CINDY SMITH, MITZI'S ROMANCES and four consecutive issues of PATSY WALKER, #'s 25,26,27 and 28 in late 1949 and early 1950. 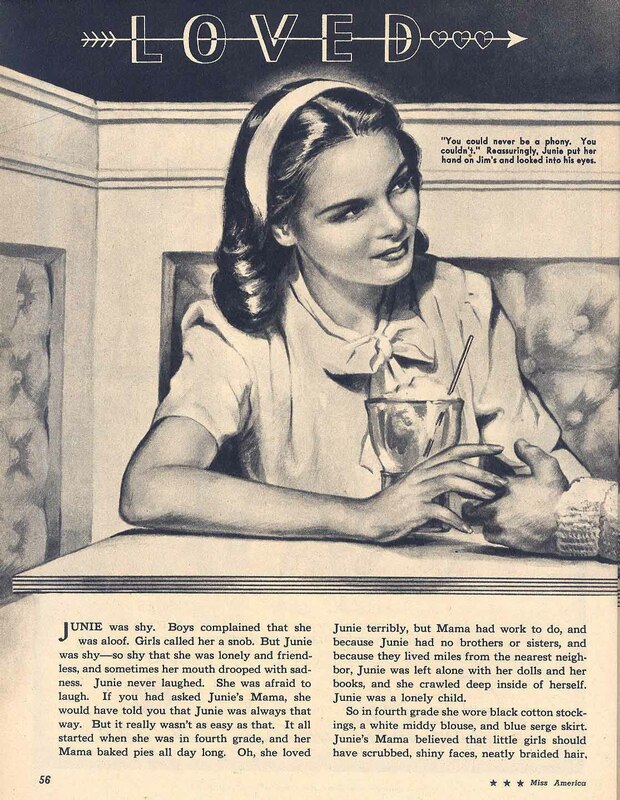 After this she vanished from comic books for good, painting magazine and book covers for a while, before working almost exclusively as a portrait painter for the rest of her career. One of the book cover accounts she had was for Julian Messner, Inc. Publishers, who published a series of books under a line called "A Romance for Young Moderns" beginning in 1946. Louise Altson painted over 20 book covers for this series, several images of which I will present below. 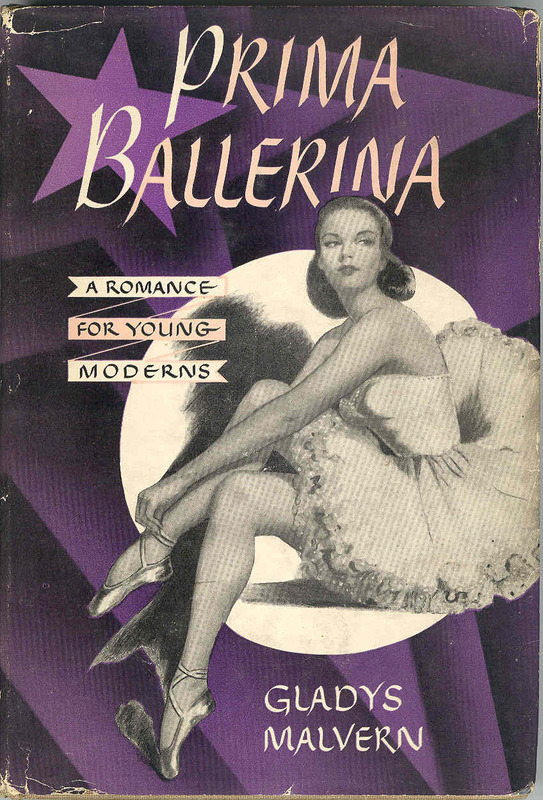 The original painting for Prima Ballerina resides with the Altson family. 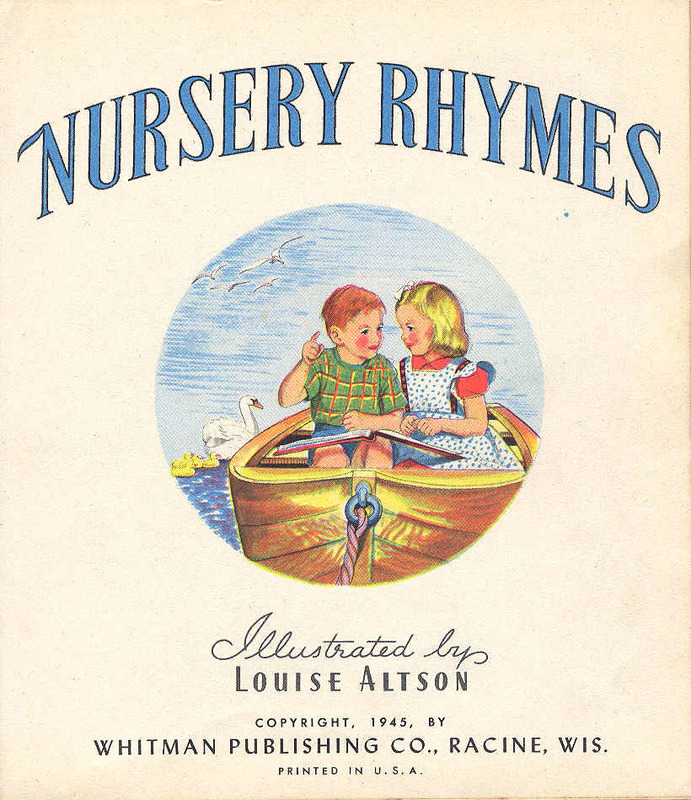 One cover was done for Farrar & Rinehart, Inc.
Of note to us above is the name of Nina Wilcox Putnam (1888-1962) as the author of Lynn, Cover Girl. 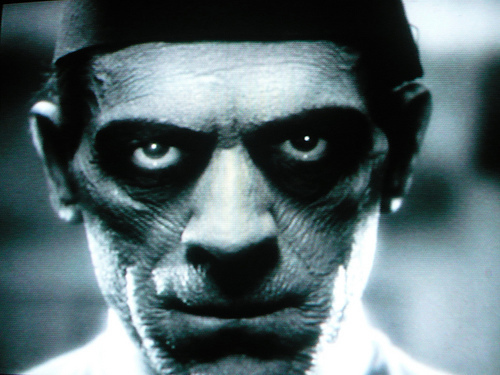 Miss Putnam was a prolific novelist and screenwriter, who wrote the original story the classic horror film The Mummy, starring Boris Karloff, was based on. She also was a feature writer and columnist for Timely's MISS AMERICA MAGAZINE throughout the 1940's and most likely knew Louise Altson through that connection, having appeared in over 15 issues together. Thanks to a reader of this blog, I recently came across a heretofore unknown Timely appearance by Altson, a double-page illustration in the first (and possibly "only") issue of a Martin Goodman magazine titled READ! Vol1, #1 (Jan/43). 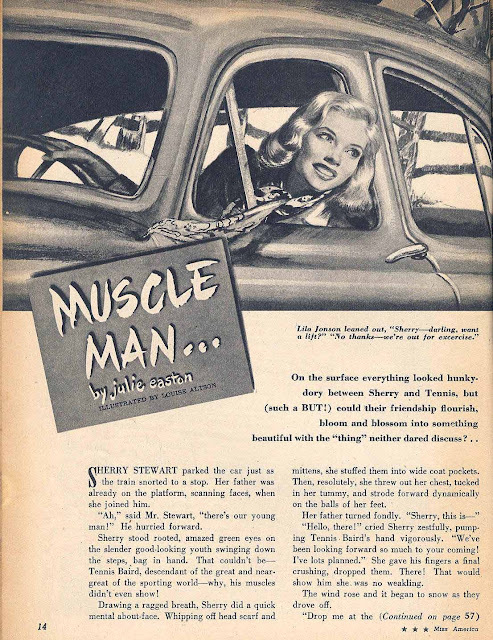 The magazine is notable for marvelous illustrations by artists we will see over and over below in MISS AMERICA MAGAZINE and other Goodman magazines and pulps, artists like Peter Driben, Norman Saunders, James Billmyer, Ralph Carlson, Arnold Allen, George Avison (Al Avison's father) and even a tiny spot by Stan Lee! In addition, Louise Altson appears leading off the issue, incorrectly credited (and misspelled) as "R. Alston". 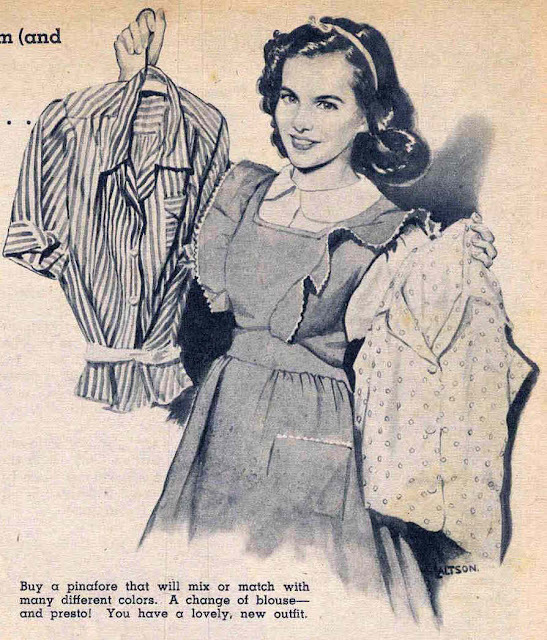 Make no mistake, this is Louise. 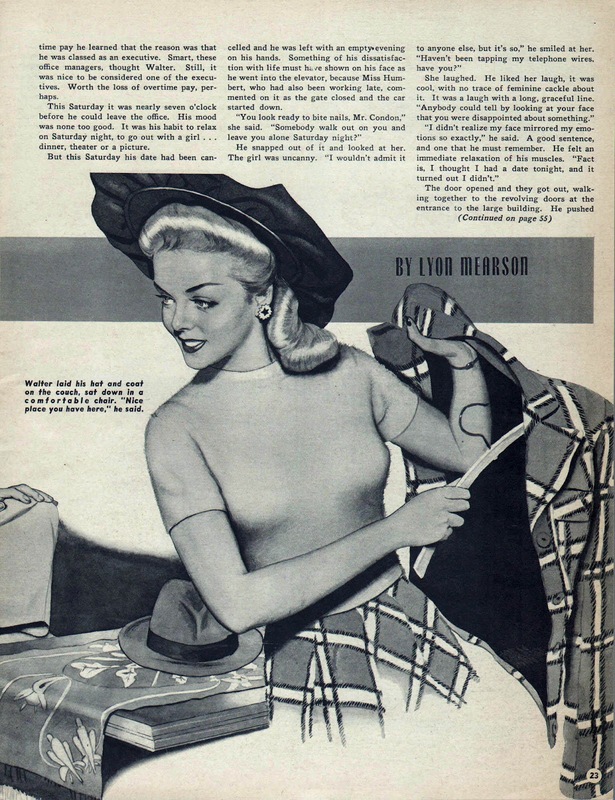 Another Louise Altson appearance has turned up since this post was published. 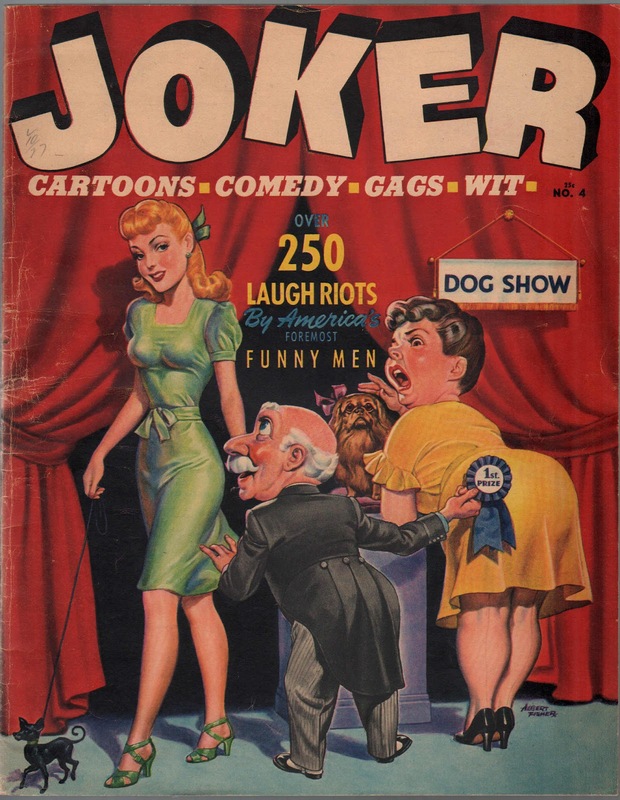 Just yesterday, while researching Timely artists for a book on Martin Goodman's early publications I'm writing, another double page Altson illustration was discovered in an unexpected place, the bedsheet humor title JOKER Vol 1, #4 (1943-44). 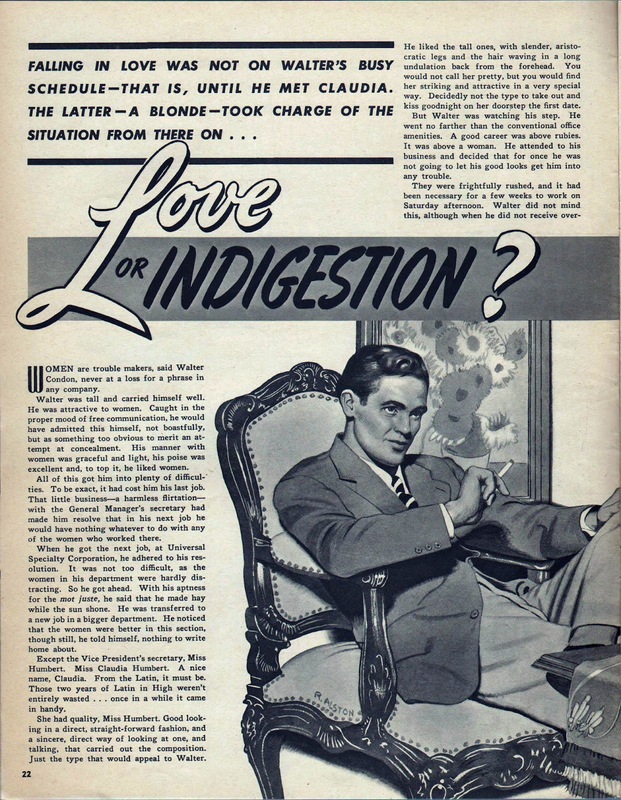 I think this was the Winter 43-44 issue although it's not stated inside. Like READ above, the signature is "R. Altson", although this time the last name is spelled correctly. 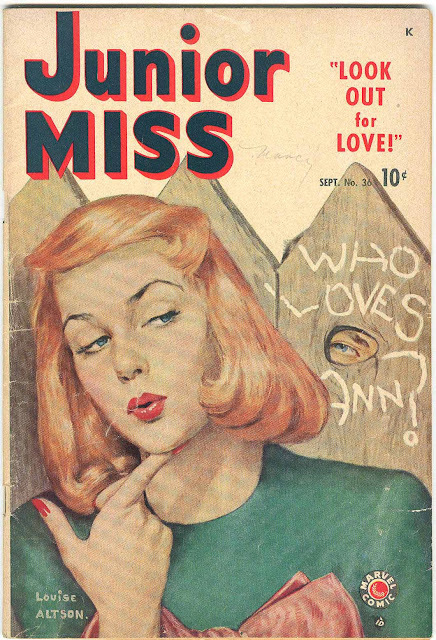 The cover artist is Albert Fisher, an illustrator who can also be found in issues of Miss America Magazine (the title to be covered below), specifically Vol 2, #1 (Apr/45) & Vol 2, #3 (June/45), issues that do not feature artwork by Louise. 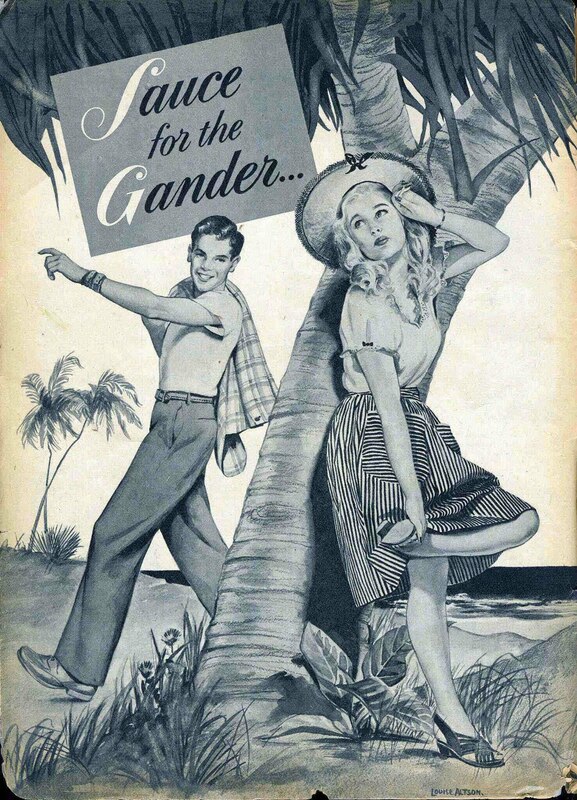 In 1949 publisher Martin Goodman began his 3rd attempt at the paperback market with the introduction of his Red Circle Books line of paperbacks. 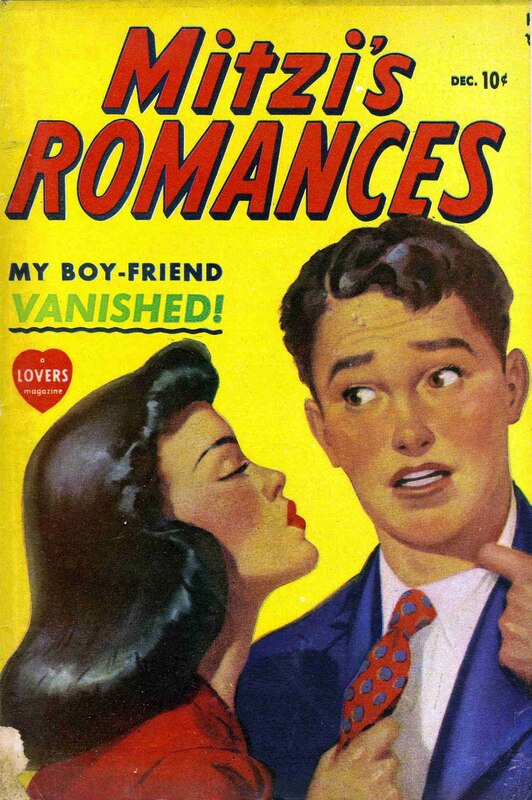 This series would become know as Lion Books beginning with the 9th issue, although for some strange reason #12 & #13 reverted back to Red Circle Books. Lion Books would ultimately reach #223 in 1955 and was joined concurrently by Goodman's Lion Library line of 175 releases from 1954 to 1957. The transition book was Red Circle Books #12 (Dec/49), "Why Get Married? 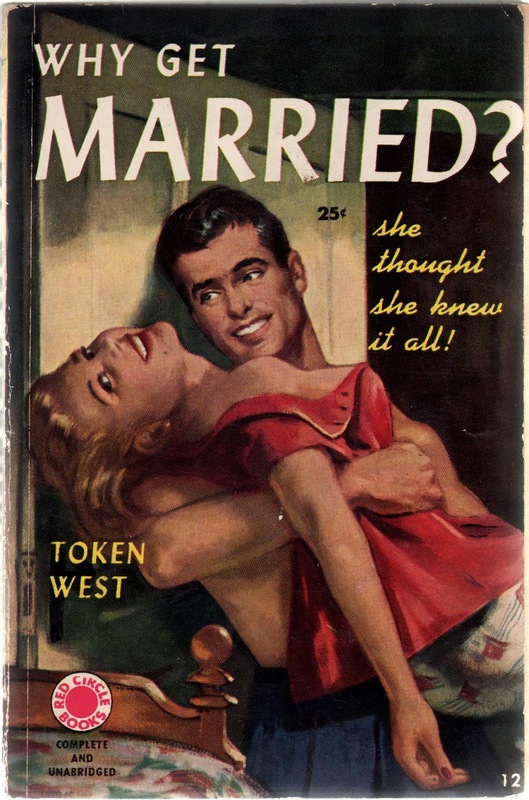 by Token West, a pseudonym for Adelaide Humphries. 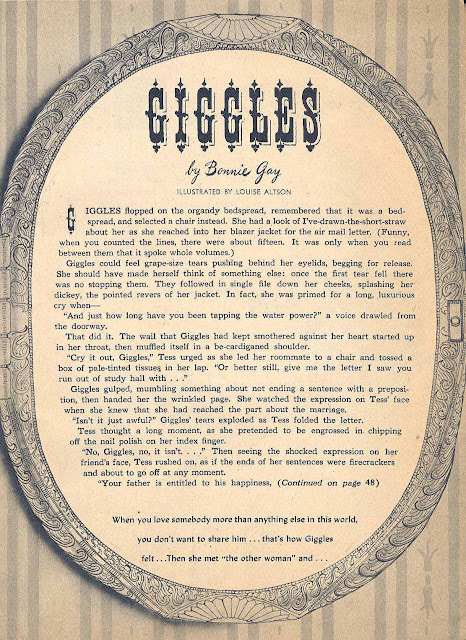 The book has the familiar Red Circle Books brand on the cover, spine and back cover. 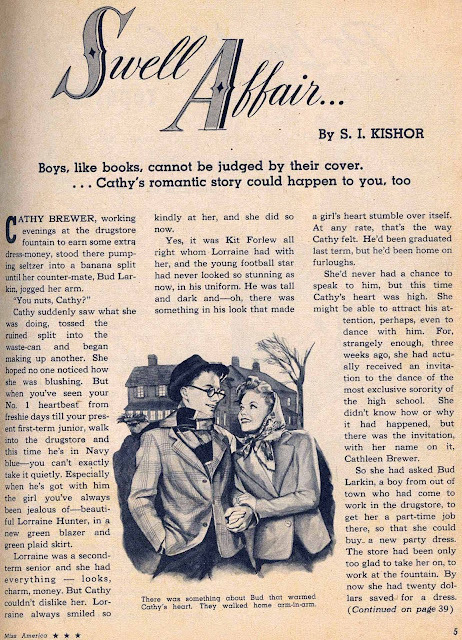 Inside, however, it's published by Lion Books, Inc. But more importantly for us, the cover is by Louise Altson. 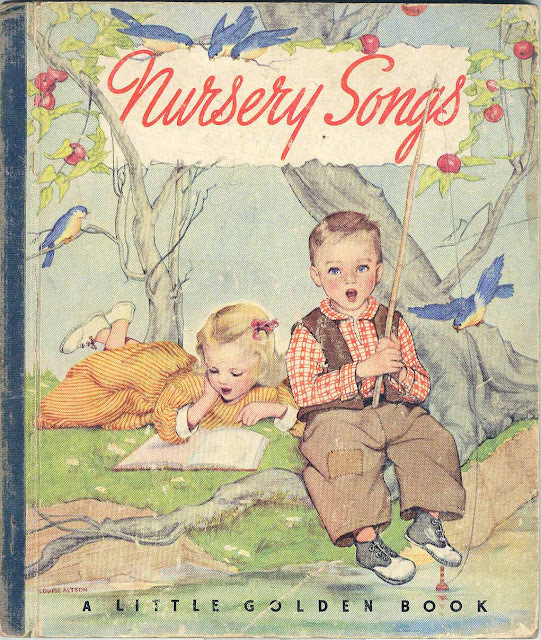 There may be others in this book line and they will be posted here as they are found. 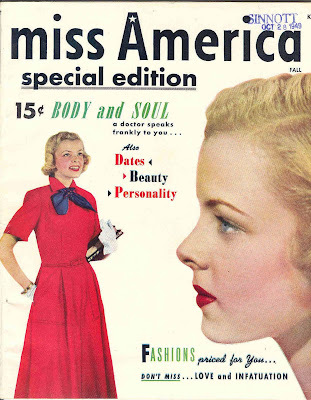 During the course of this post I will mention many of the features and/or contributors to MISS AMERICA MAGAZINE in the issues that feature Louise Altson artwork, but I don't want to get bogged down with extraneous details as I plan a post on the long-running title's history in the future. The Miss America comic feature penciled by Pauline Loth would continue to appear in the first four magazine issues before being supplanted by features like Danny, Betty Blair Reporter, Joyce Reynolds and the aforementioned Patsy Walker, who would eventually be the main star of the title when the magazine issues ended and the title changed back into a regular newsstand comic book in 1950. 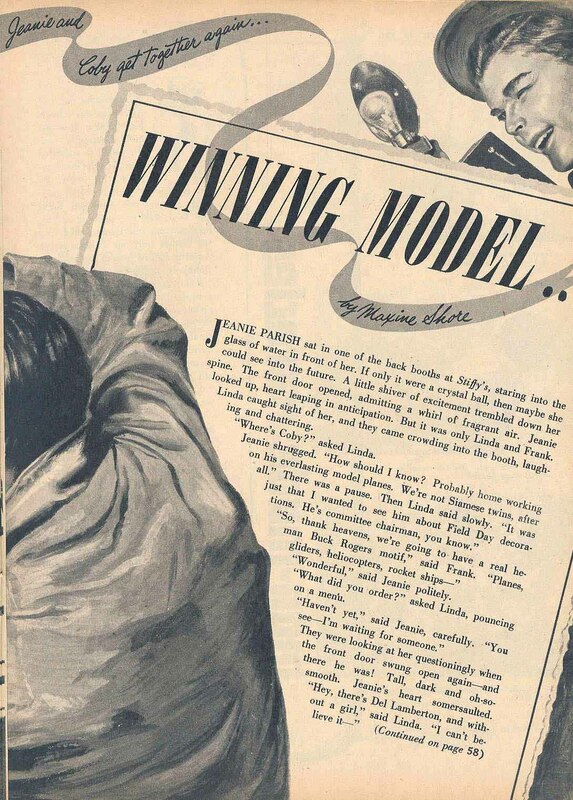 Pauline Loth as Pauline O'Sullivan, would continue on as fashion editor of the magazine. 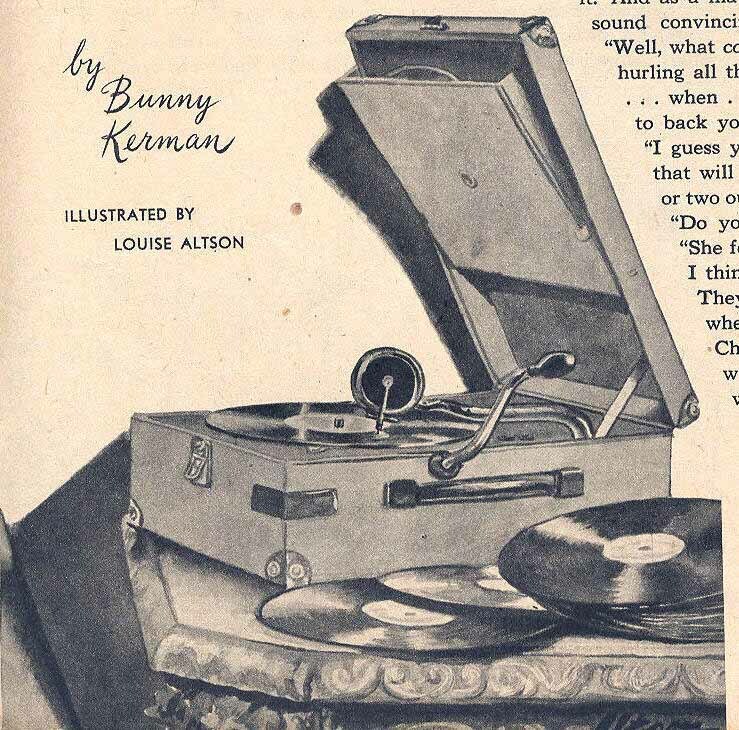 Louise Altson's debut art appears on page 20 and 21. The images are realistic and dramatic. This is one talented artist seriously trained in classic illustration. 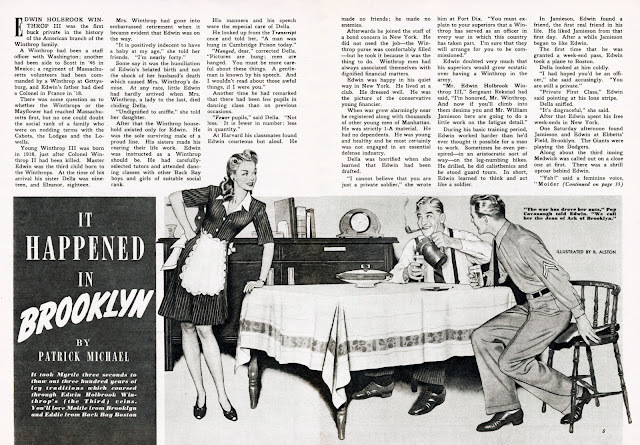 Other artists in this issue include illustrator James Billmyer and Elmer Tomasch, known as Tom Tomasch to the guys on the Timely comics staff. 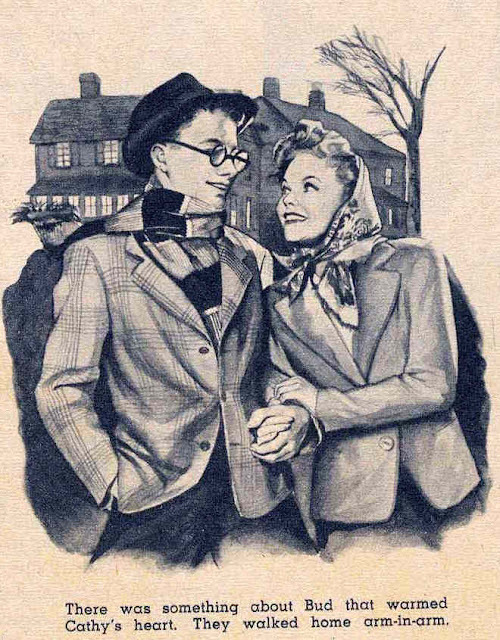 Tomasch would also go on to a career in fine art after his comic book days. 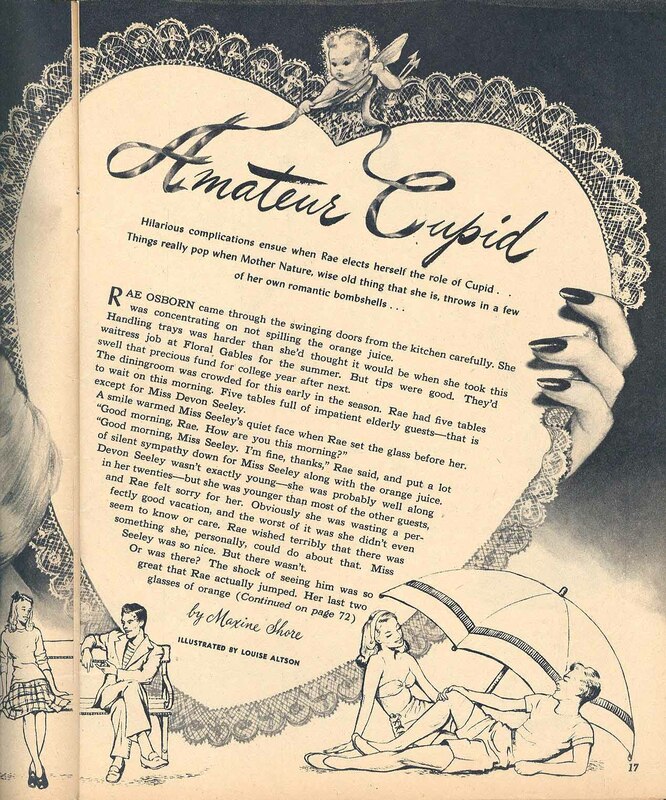 14 pages of Miss America comic art and 7 pages of Patsy Walker art are also inside. 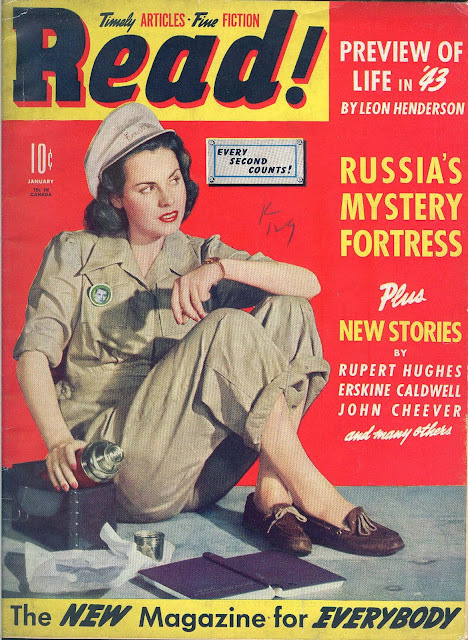 The very next issue is the only non-photo cover of the magazine's 1940's run. Louise Altson paints the cover instead. 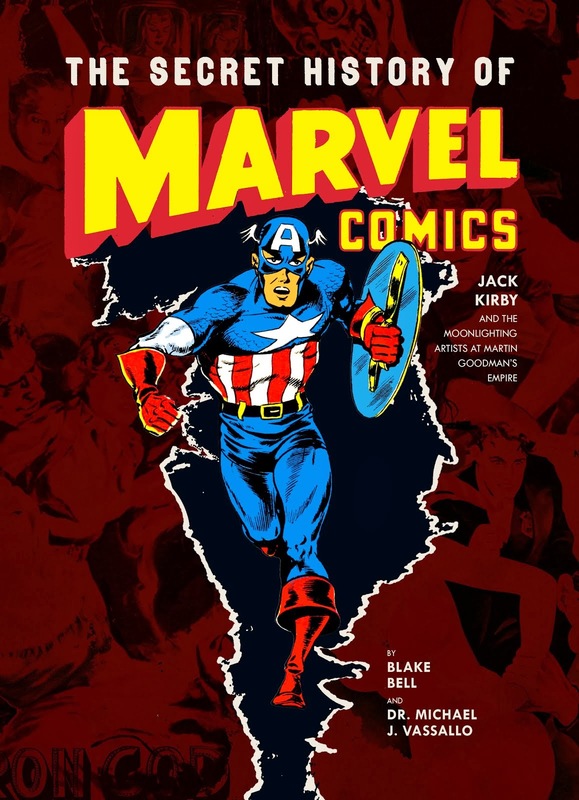 14 pages of Miss America comic art and 7 pages of Patsy Walker story art are also in this issue. Double-page splash. 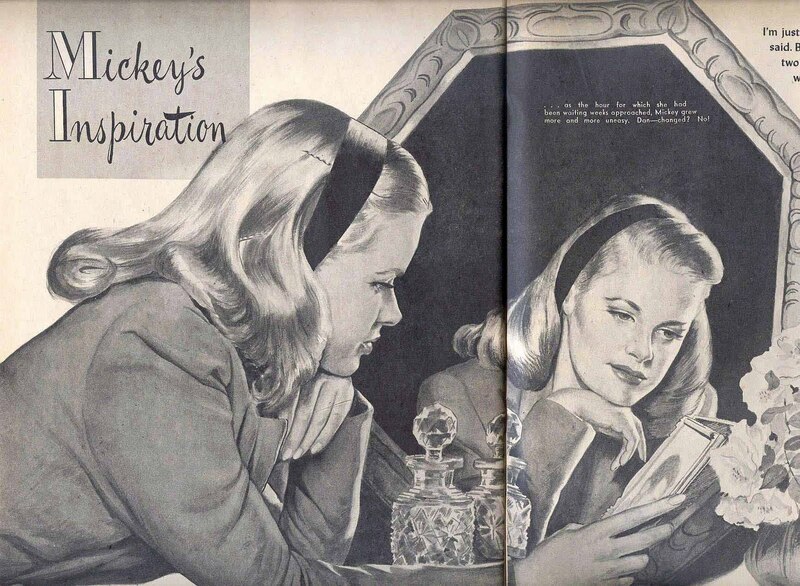 This issue also has illustrations by Peter Driben and Elmer (Tom) Tomasch, as well as 14 pages of Miss America and 7 pages of Patsy Walker story art. 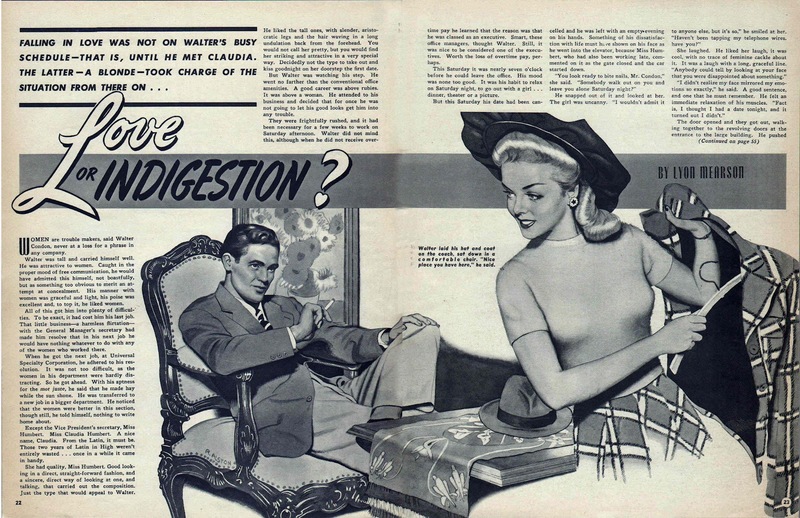 This was a double-page splash also. James Billmyer illustrates a feature in this issue and it also contains 14 pages of Miss America and 7 pages of Patsy Walker story art. James Billmyer also inside. 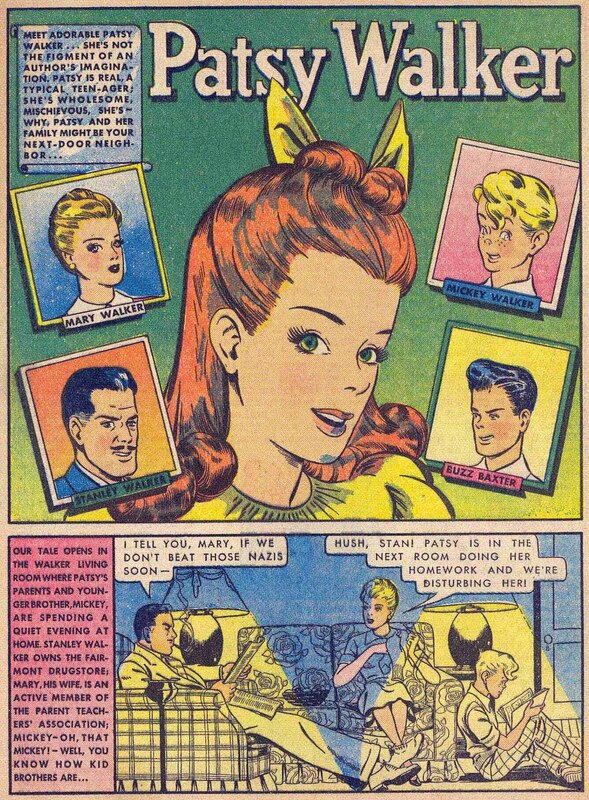 Patsy Walker is now the main comic feature (7 pages) joined by Danny (7 pages), who replaces the Miss America comic feature. Danny appears to be penciled by Mike Sekowsky. We now jump ahead 5 months to Vol 2, #5 (Aug/45). 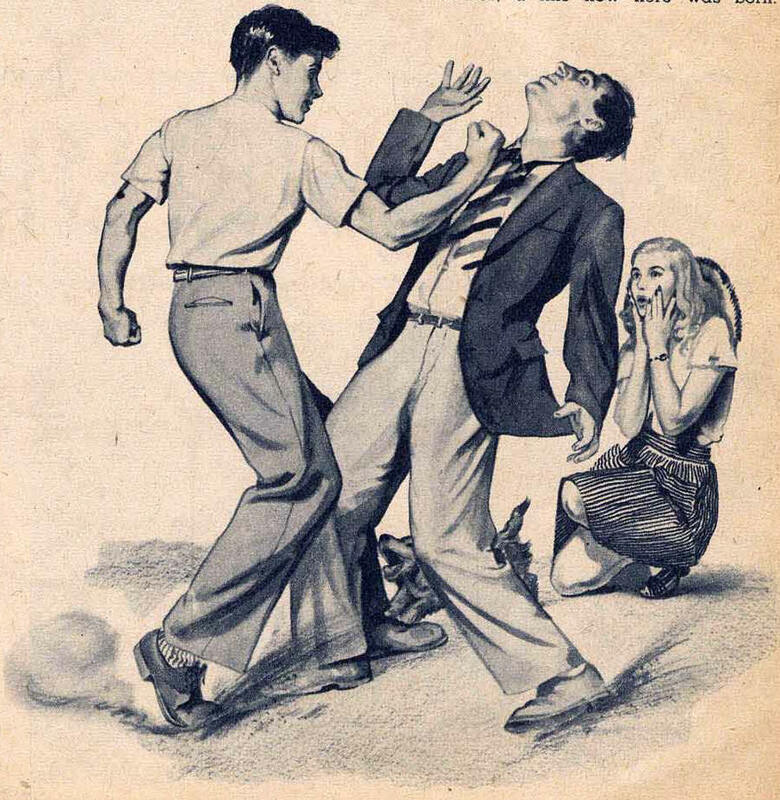 Another double-page splash. Patsy Walker has 8 pages and Danny has been replaced by Betty Blair (5 pages), also penciled by Mike Sekowsky. 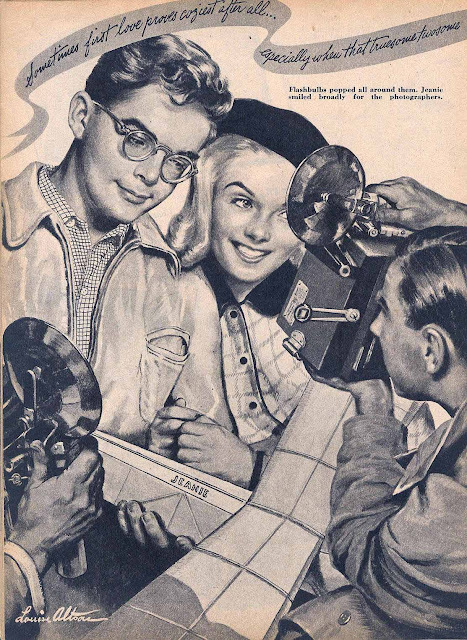 James Billmyer is also again in this issue. 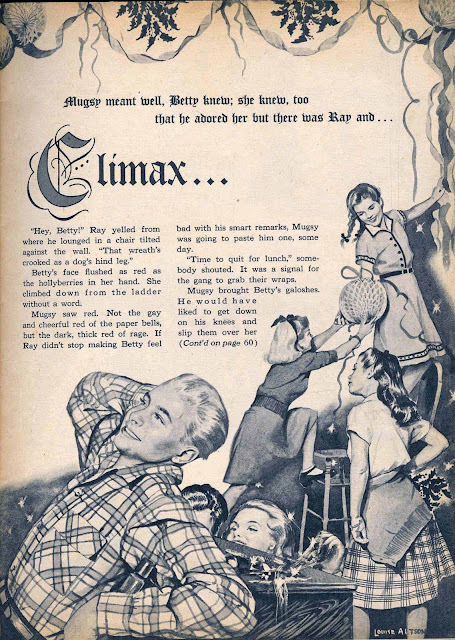 James Billmyer illustrations along with Patsy Walker (8 pages) and Betty Blair (6 pages). Another two-page spread that I was able to scan decently enough to present here. Another double-page spread. 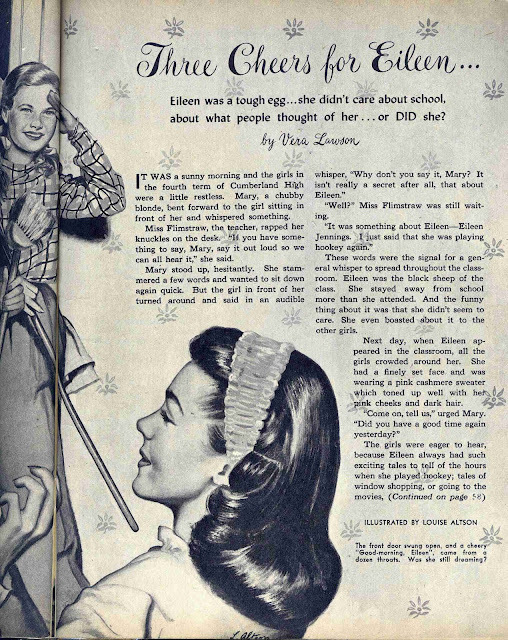 Patsy Walker (7 pages) and Betty Blair (6 pages) also in this issue. "Imagine my surprise, as I am looking through and admiring Mom's illustrations on your blog, to recognize the lead crystal jar in the illustration! I also realized that the pot holding the flowers is one of Mom's pewter bowls that I have that she used often in her still-life's." 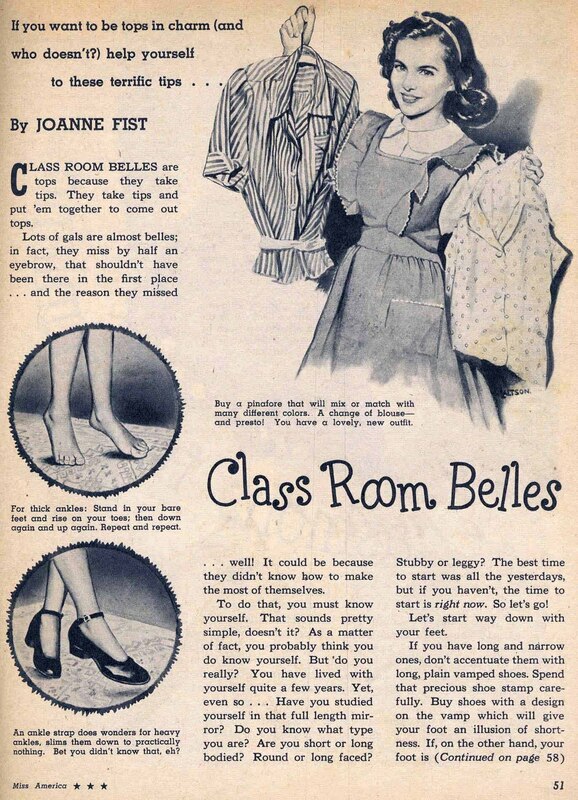 Jean then forwarded this photo to me. 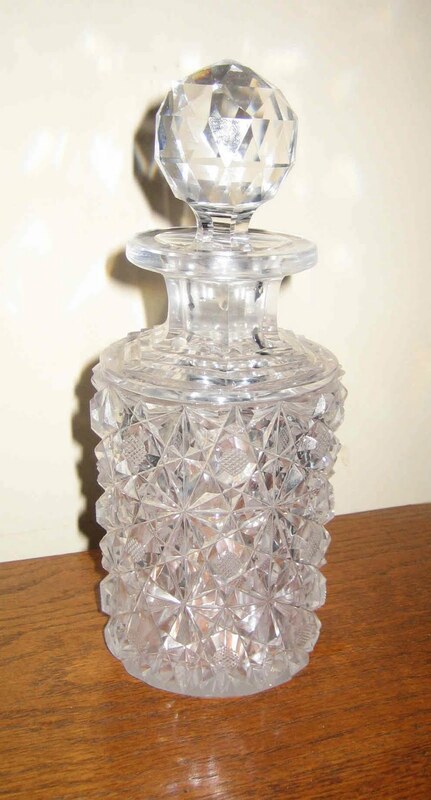 The crystal jar is still in the family after 66 years! Double-page spread. Patsy Walker (7 pages) and Betty Blair (6 pages) also in this issue. Before continuing, I want to pause here and mention a very rare Timely premium advertised in the pages of MISS AMERICA Vol 3, #3 (Dec/45). The ad is for a holiday booklet devoted to Christmas fun, fashion, recipes, etc, produced by the MISS AMERICA staff and offered for 10 cents to readers who wrote in and ordered it. 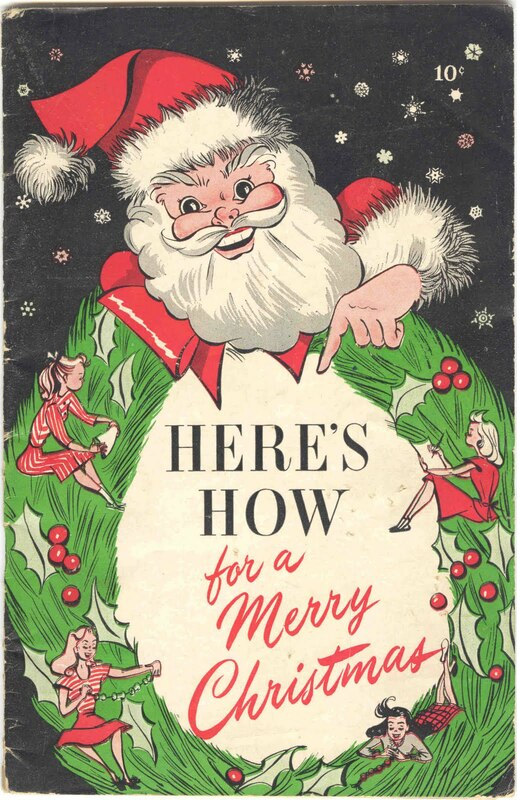 The title is "HERE'S HOW FOR A MERRY CHRISTMAS". Well after 20 years of trying, I "finally" found one!! The cover artwork, I believe, is by Marion Gerrick. 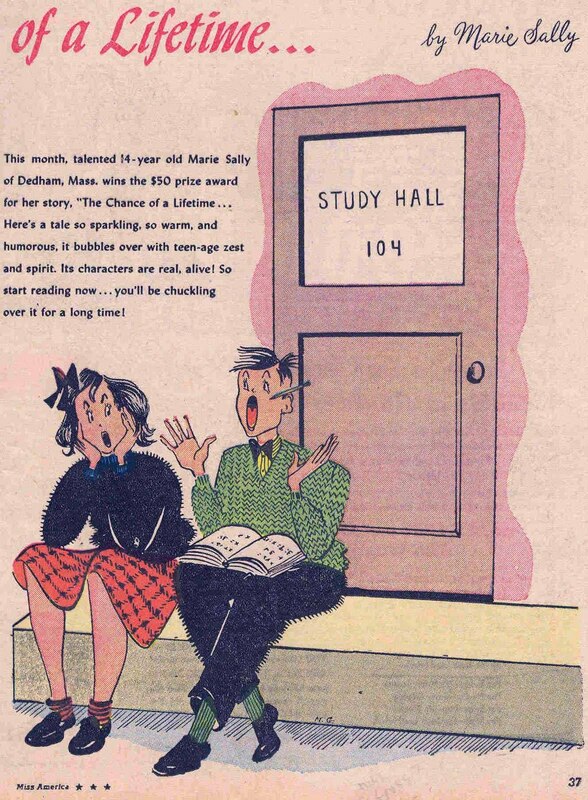 Also James Billmyer, Patsy Walker (8 pages) and Betty Blair (6 pages). A gorgeous double page splash below! 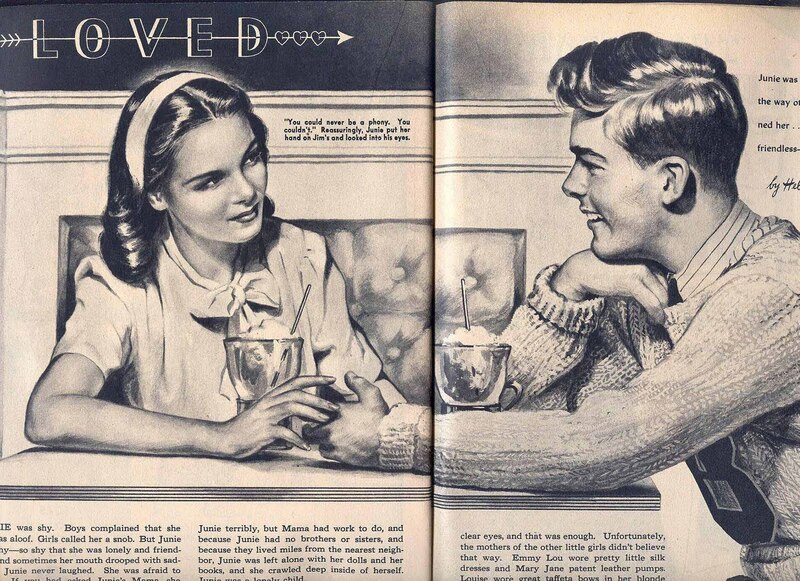 Just stunning, and exquisitely rendered. Comic content down to only Patsy Walker (8 pages). 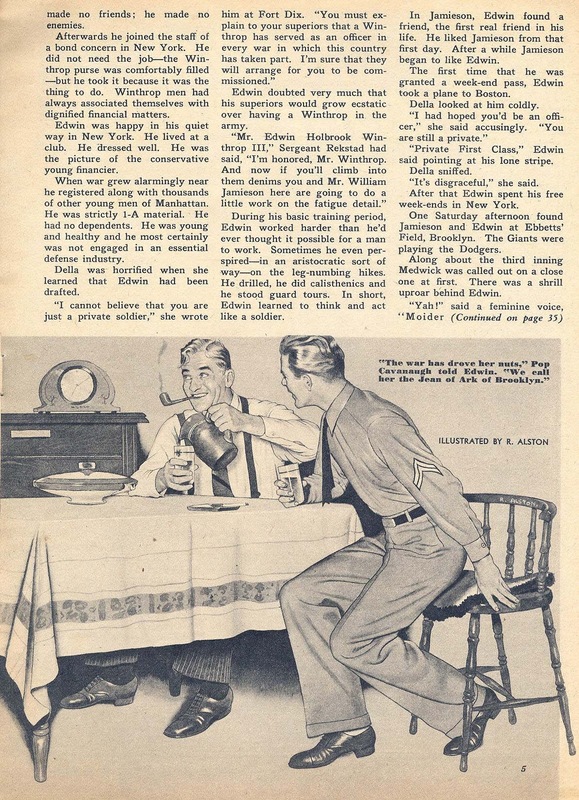 Patsy Walker (7 pages) and an article purported to be written by jazz icon Duke Ellington are also in this issue. 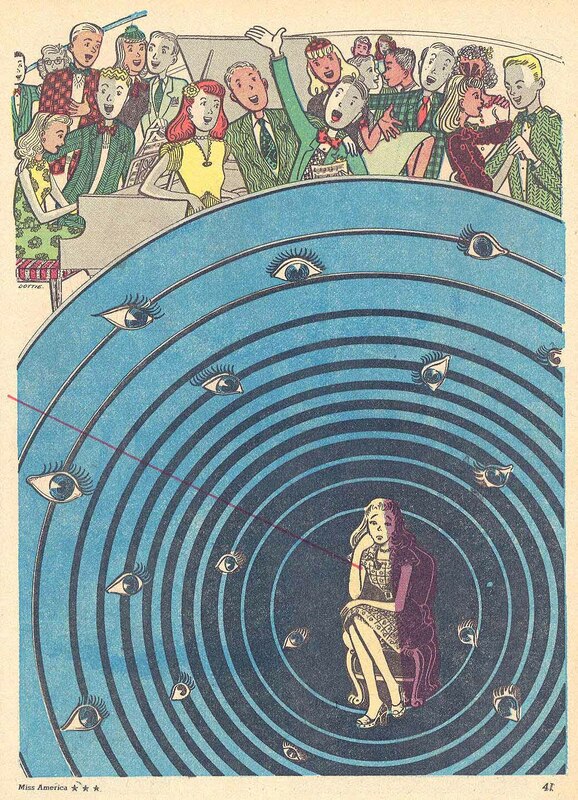 Double page spread and Patsy Walker (7 pages). A beautiful double page spread highlights extremely photo-realistic artwork. 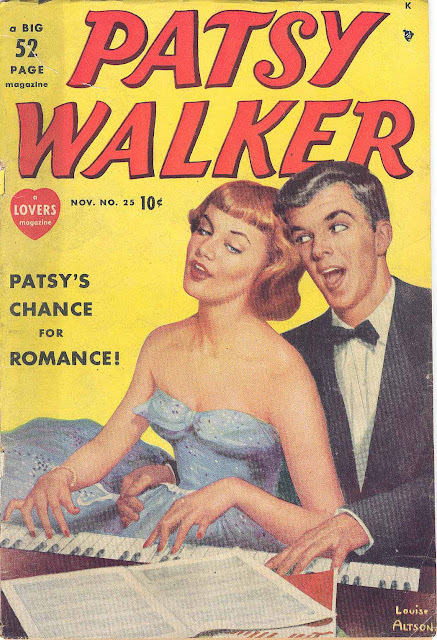 James Billmyer and Patsy Walker (7 pages) also in this issue. 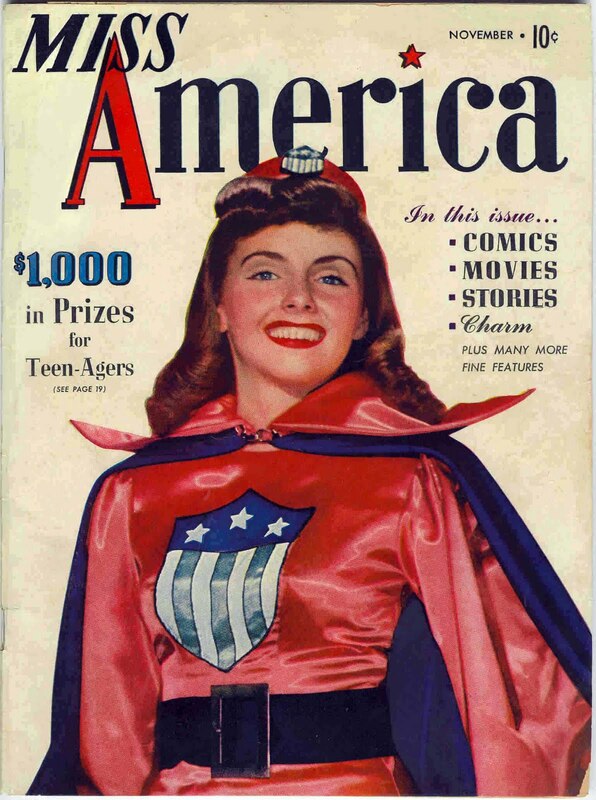 The next issue of MISS AMERICA, Vol 4, #3 (July/46), has a two page spread that is unsigned, or more likely, the signature is cut off at the bottom. 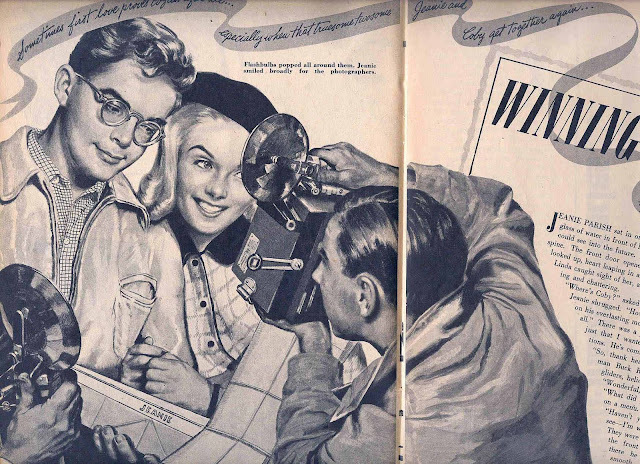 Going by all the artwork I've seen by both Louise Altson and James Billmyer in this title, there is more stylized animation in the poses and faces so I think what I'm looking at is James Billmyer rather than the poised and subdued figures of Louise Altson. Therefore, I'm not posting the images here. Similiarly in MISS AMERICA Vol 4, #4 (Aug/46), an unsigned two page spread has me unsure. 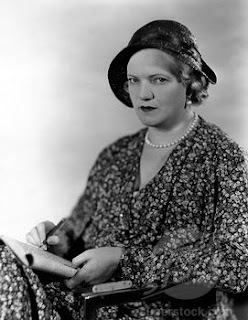 It doesn't look like James Billmyer so it could Louise Altson. Here it is below. What do you think? 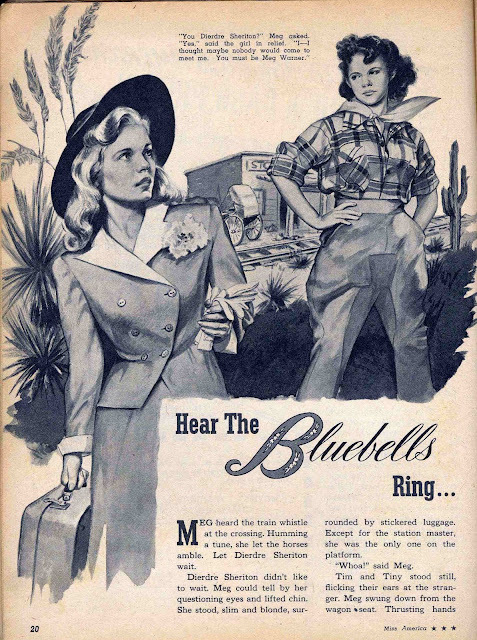 With the Vol 4, #5 (Sept/46) issue, Bessie Little is replaced as editor-in-chief by Thea Tyler and the title begins to pick up an enormous amount of advertising by top woman's fashion and cosmetics companies. 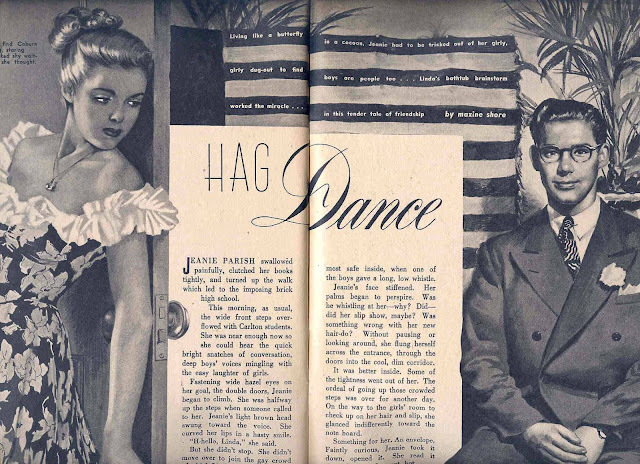 The actual table of contents doesn't start until 20 pages in! 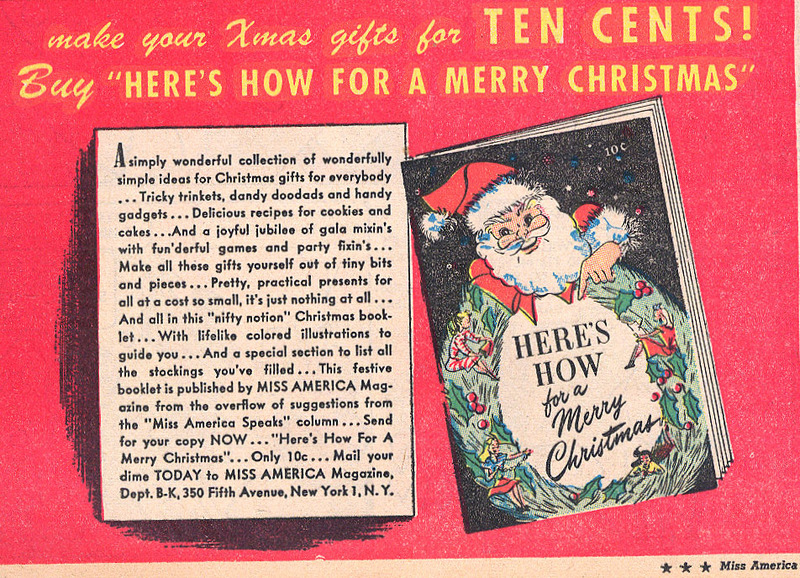 The first 19 pages are advertisements! 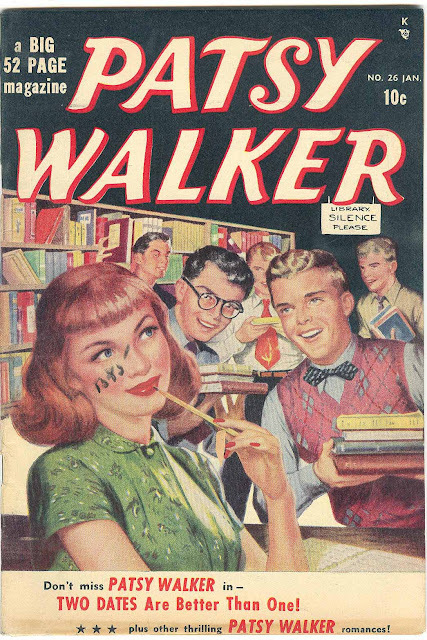 James Billmyer and 8 full pages of Patsy Walker penciled and inked by Christiopher Rule, who has completely taken over the feature. Rule had been involved since the beginning on and off (mostly "on") as an inker but now is rendering the entire feature by himself. 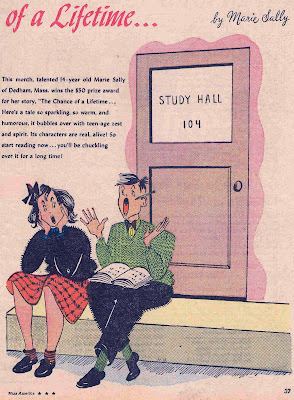 Along with the 2-page spread by Altson, look for James Billmyer, Harvey Kidder and 8 pages of Patsy Walker also in this issue. 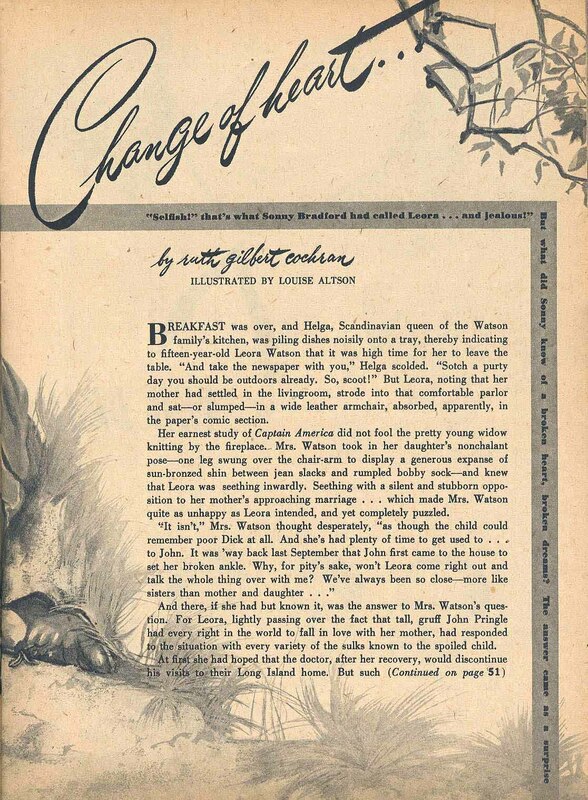 Bessie Little is out again as editor, replaced now by Francis Glencott. 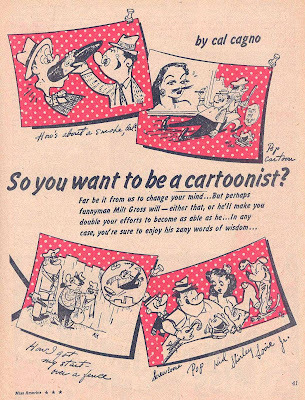 Along with a 2-page spread by Louise Altson, look for unsigned James Billmyer, unsigned Harvey Kidder, 8 pages of Patsy Walker and a 4-page feature called "So You Want to be a Cartoonist? 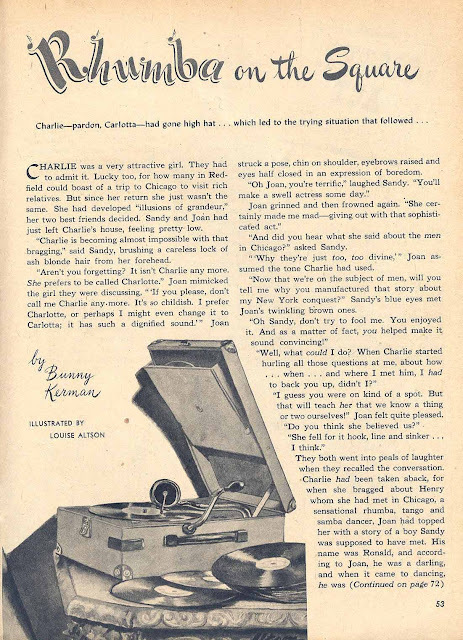 ", a story about Milt Gross with cartoons by Milt Gross, written by "Cal Cagno, who is known to Timely aficionados as Joe Cal Cagno. 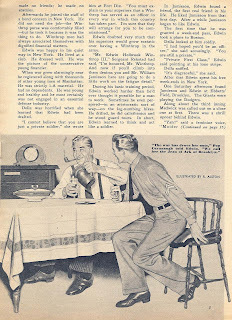 Cal Cagno hails way back to the the early days at Timely as a writer on "Zephyr Jones" (drawn by the unknown Fred Schwartz) and "Mr. E" (drawn by Al Carreno) in DARING MYSTERY COMICS #2 (Feb/40). 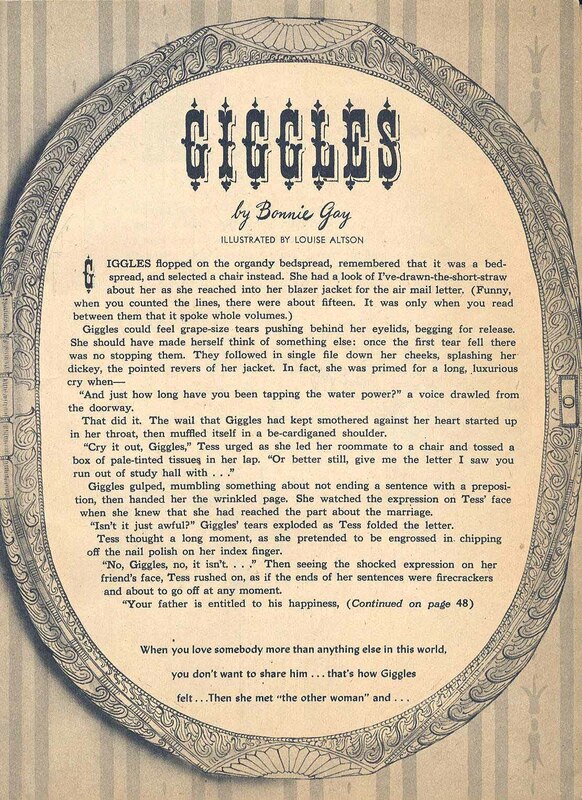 A second and final installment of "Zephyr Jones" appeared in MYSTIC COMIC #1 (Mar/40). 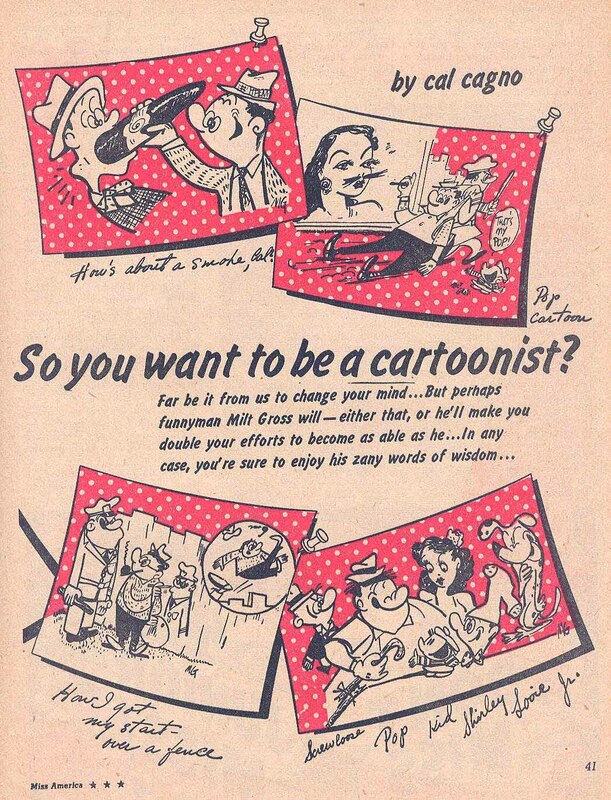 Calcagno was also listed in the masthead credits of KRAZY KOMICS #5 (Jan/43), #11 (Sept/43), #12 (Nov/43), #13 (Jan/44) and TERRYTOONS #4 (Jan/43), #5 (Feb/43), #10 (July/43), #11 (Aug/43), #12 (Sept/43), #13 (Oct/43). These are assumed to be writing credits. 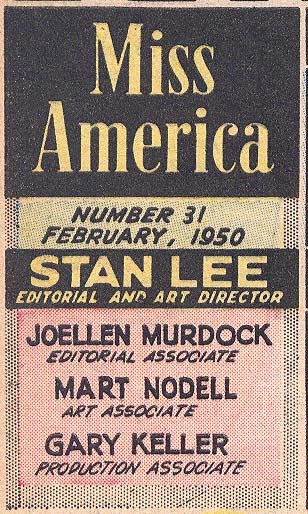 With the start of Volume 7, #1 (Aug/47), MISS AMERICA undergoes a big change as Stan Lee takes over as editor and art director. 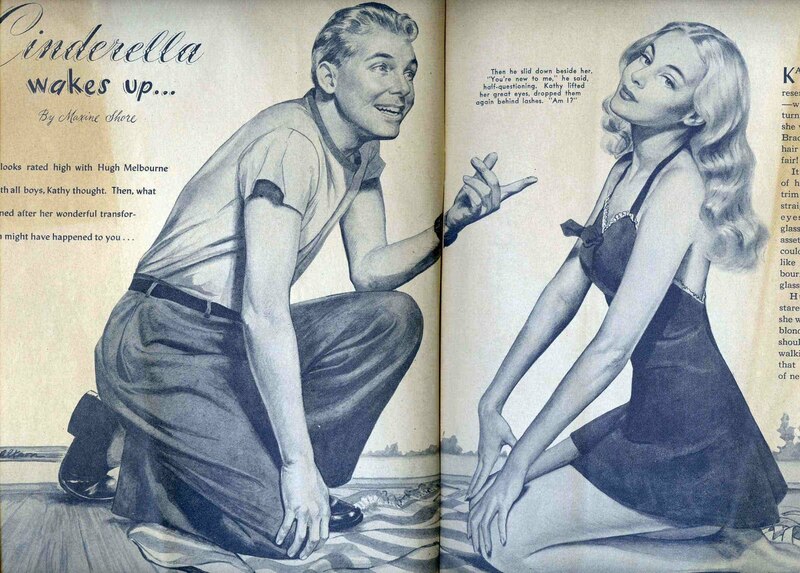 The magazine, while still sporting photo covers, will gravitate back towards being a comic book. 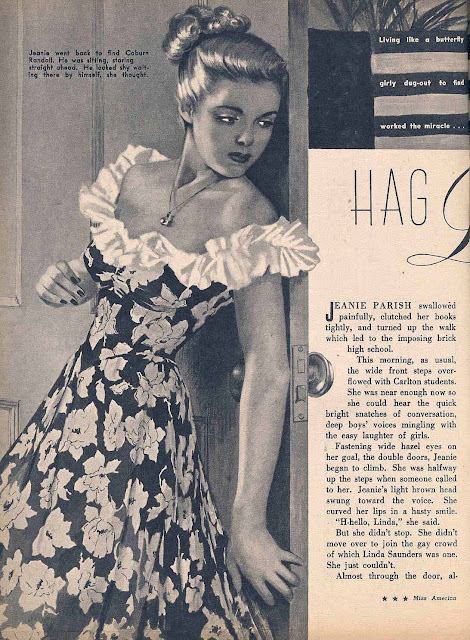 Nearly all of the fashion pages and commercial advertisements are dropped. A second and then a third Patsy Walker story is added and now the text and feature illustrations are being done by Timely staff artists like Syd Shores, Mike Sekowsky, Christopher Rule, Mario Acquaviva, Frank Carin and Lin Streeter. 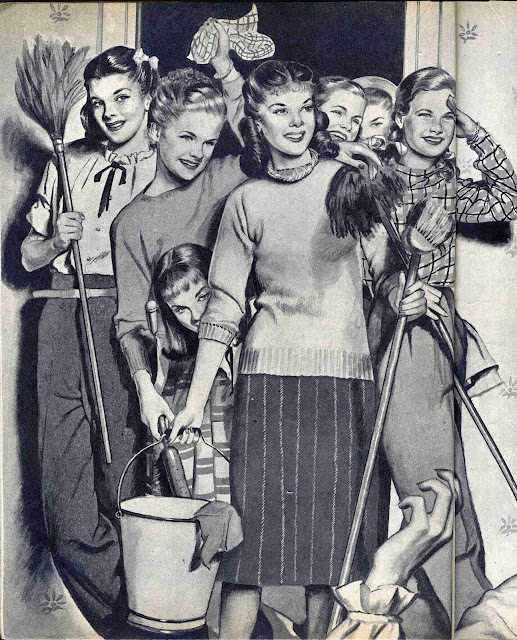 Ruth Atkinson even freelances illustrations to accompany text stories she writes. 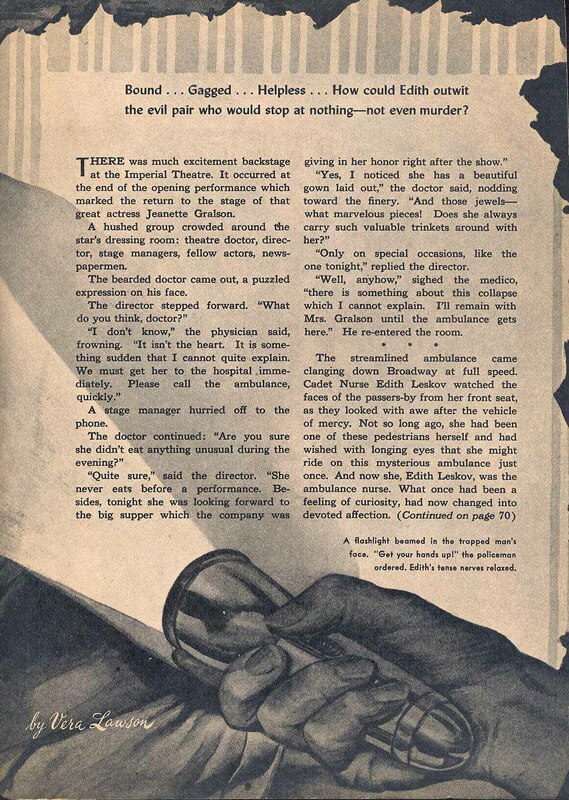 Most surprising of all, is the possible discovery of pulp and golden-age Timely artist out of the Chesler shop, Newt Alfred, drawing text illustrations in Vol 7, #13 (Aug/48)! 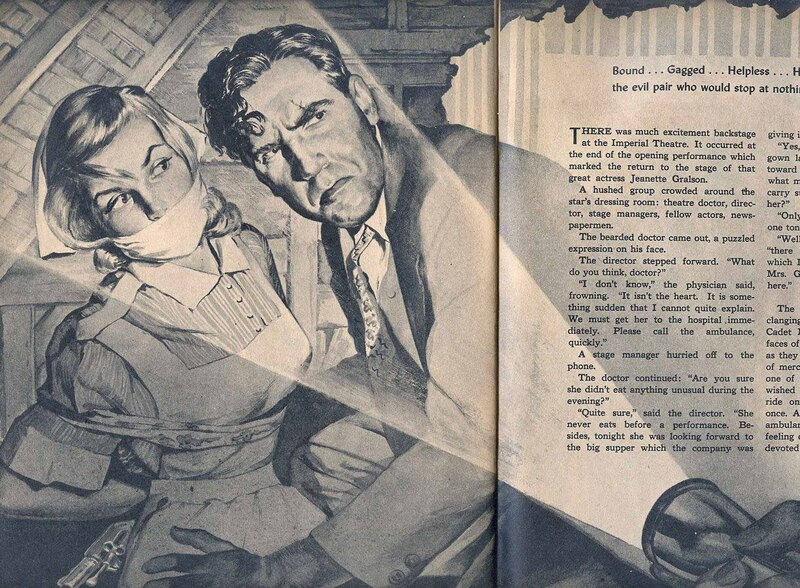 Alfred is known as the pulp artist on The Whisperer and his previous Timely appearances are relegated to features in MYSTIC COMICS on features like The 3 X's, The Blue Blaze, Zara of the Jungle and The Invisible Man Known As Dr. Gade in 1940. 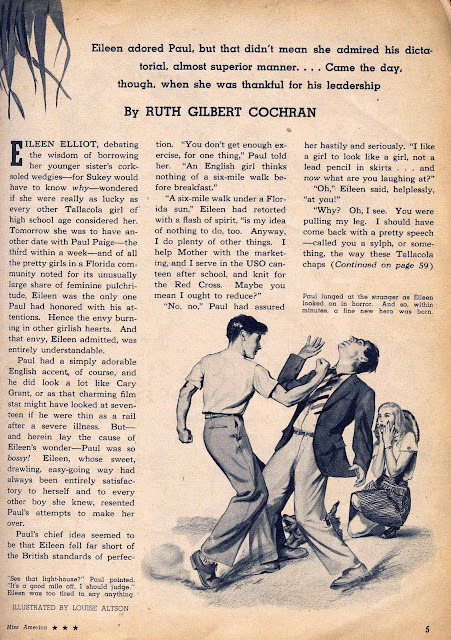 The book is now Patsy Walker stories and 3 text stories. This makes MISS AMERICA identical in format to her sister publication JUNIOR MISS, which is where we will see Louise Altson turn up next. The format for this "old" MISS AMERICA did not die, though. 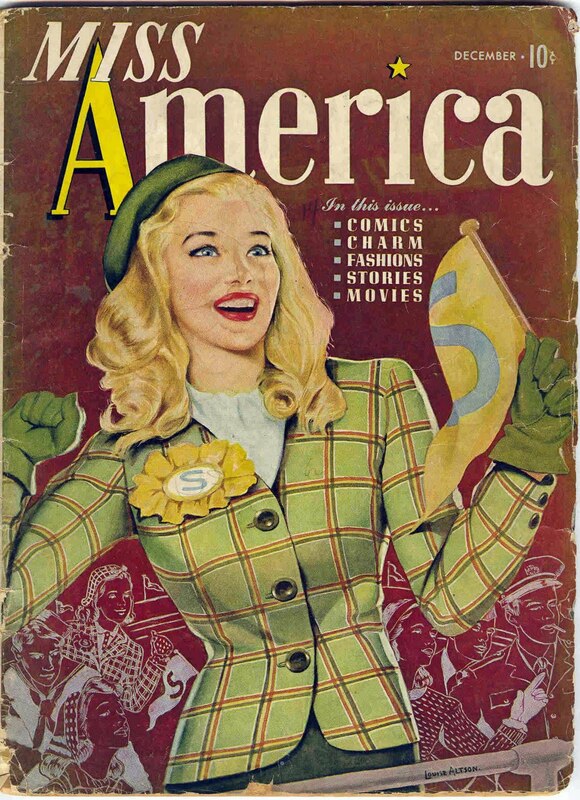 Starting cover date Fall/49, the "girl's charm and fashion mag" was reintroduced as a regular newsstand magazine published by Martin Goodman's magazine line and titled MISS AMERICA SPECIAL EDITION. Three quarterly issues were released among the Goodman true confession and Hollywood scandal magazines, with the last two titled MISS AMERICA YOUNG LIFE. 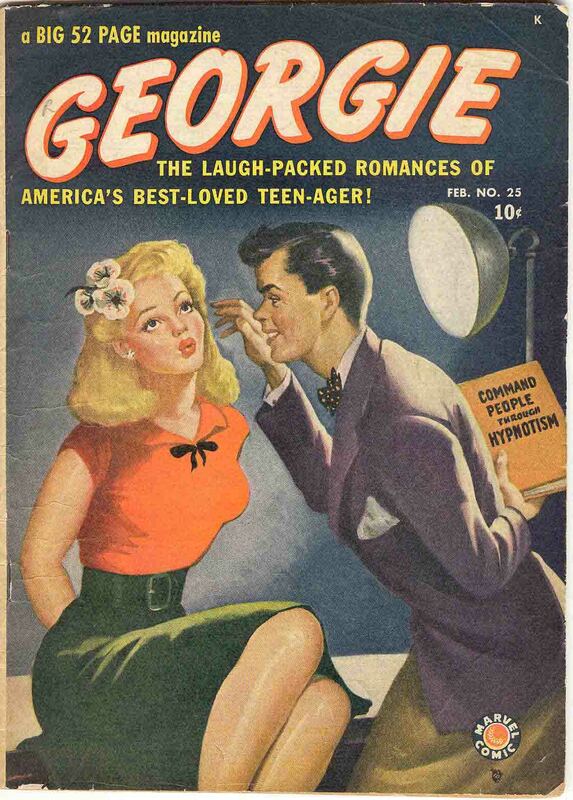 With Miss America's change in "text story" format from one of serious illustration to standard comic art, Louise Altson will spend the rest of her career in comic books painting covers for teen/romance books. 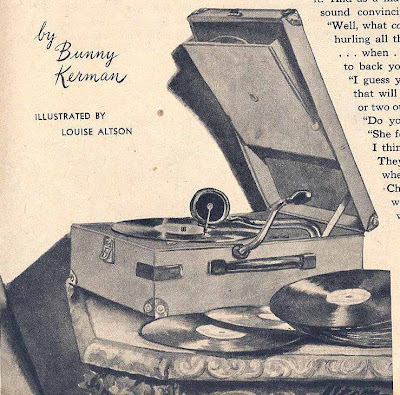 Before we leave MISS AMERICA completely, I want to mention one more artist who was the most prolific artist contributing to the Bessie Little run of the title, Volumes 1 through Volume 6. 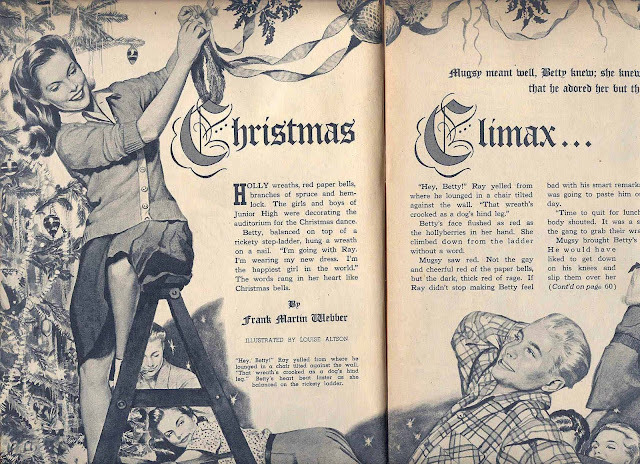 The artist was Marion Gerrick, the cover artist seen above on the Holiday/1945 Here's How For A Merry Christmas premium. 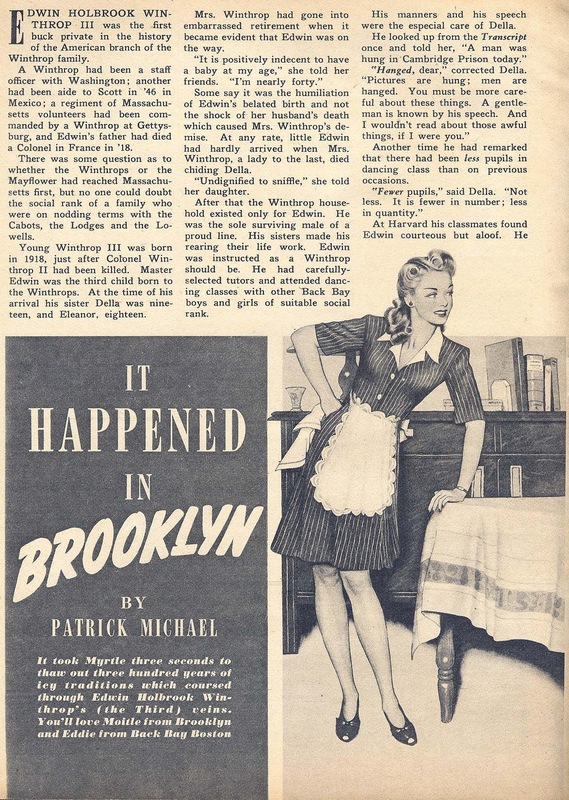 Miss Gerick was the Sergio Aragones of MISS AMERICA, the title's workhorse, contributing story and article title illustrations, "marginal" cartoons along the borders, ad cartoons, fashion illustrations, "everything" needed in "every" issue published throughout the first 6 volumes except for a short span when she was spelled by "Dottie" and Phyllis Muchow. 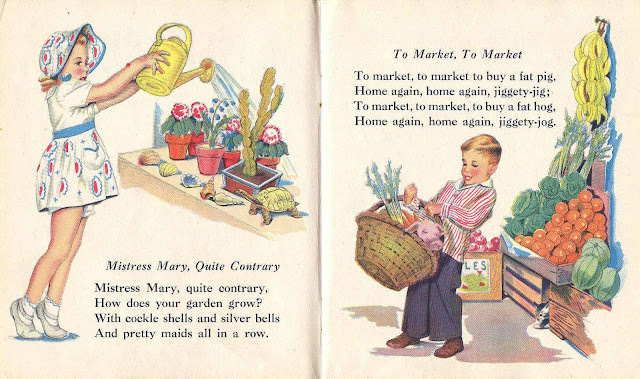 She usually signed her cartoons and illustrations "Marion", "Gerrick", "M.G. 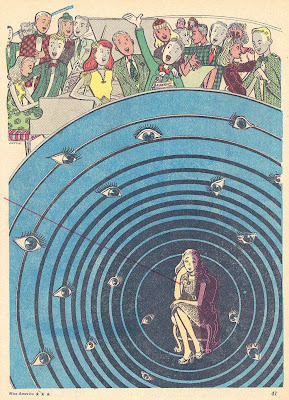 ", or sometimes not at all, but her art is unmistakable and immediately identifiable. 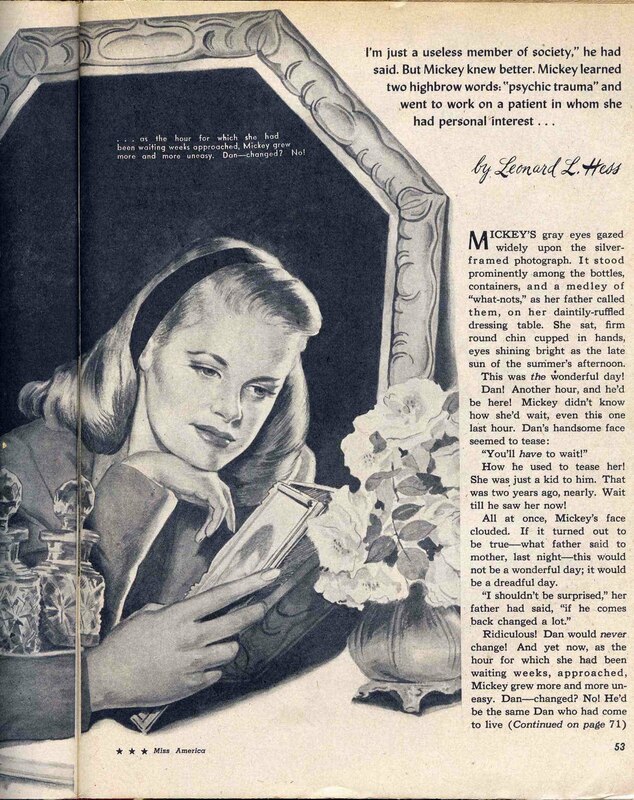 Miss Gerrick would go on to success in the fine art world and is owed a deserved mention here. As Louise Altson moved on to painted covers in 1949, first up is JUNIOR MISS. 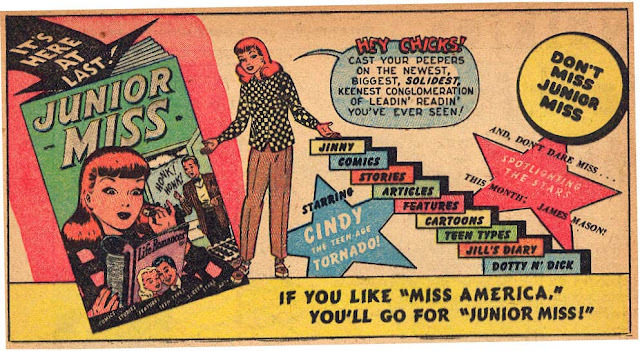 As I already stated above, JUNIOR MISS was MISS AMERICA's sister title, spinning off it's debut issue as #24 (Apr/47) and continuing 15 additional issues through #39 (Aug/50). The final two issues were as a comic book. 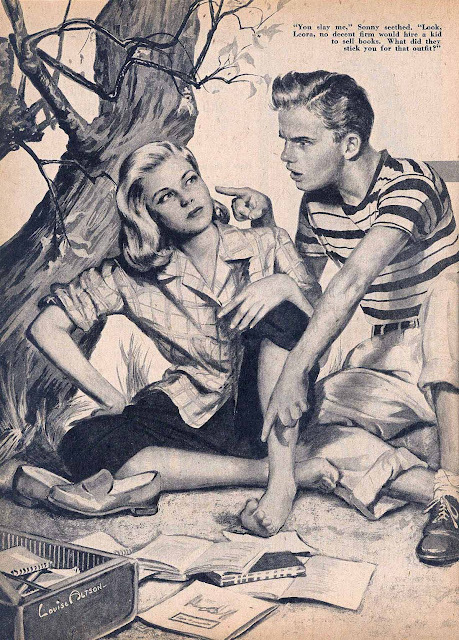 The initial issue introduced the Timely teen character Cindy Smith, as drawn by Ken Bald. 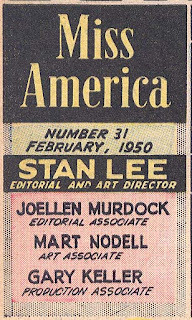 Stan Lee was from the very start the editor and art director and as also seen above, within 4 months would also take over the reins of MISS AMERICA, turning it into a carbon copy of JUNIOR MISS, that is, comics and text stories illustrated by "Timely" staff artists, and not the girl's fashion and charm magazine it once was. In the middle of the run, three painted covers appeared. 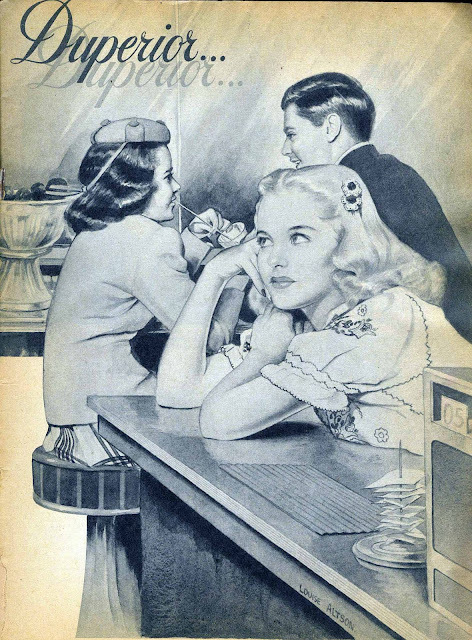 #'s 35,36 & 37. Half of Louise Altson's signature is cut off the bottom of this scan and in every copy of this book I've ever seen. Next we have PATSY WALKER COMICS, with the second Timely teen character (after Tessie The Typist) and third to get her own title (after TESSIE THE TYPIST and GEORGIE). After debuting in MISS AMERICA Vol 1, #2 (Nov/44), Patsy Walker's feature continued on in every issue of the title until cancellation cover date Nov/58, a total of 126 issues. 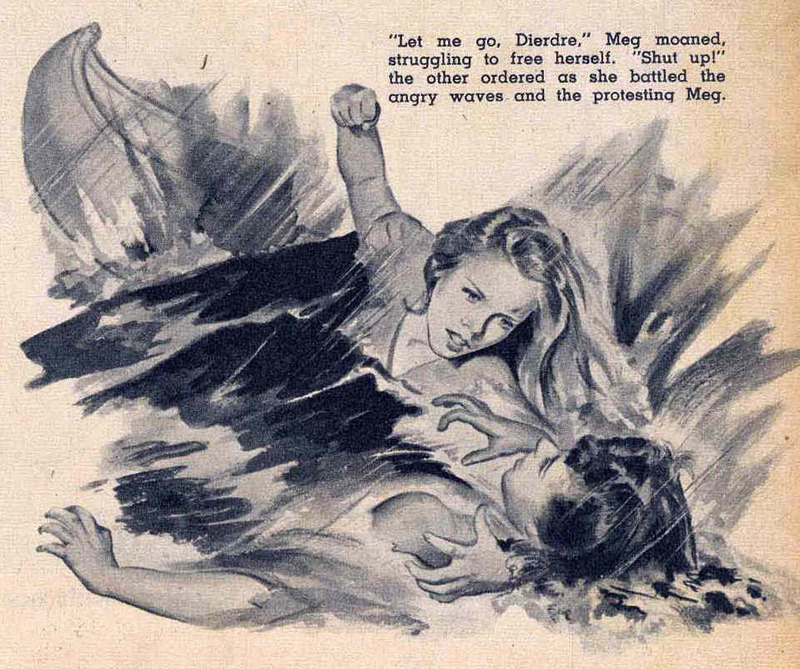 She got her own title cover dated Summer/45 (lasting 124 issues) and spun off a third title, PATSY AND HEDY, lasting 110 issues of its own. 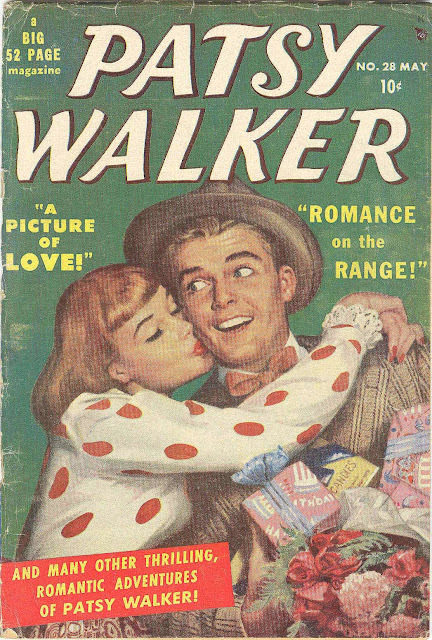 Along the way there was also the 6 issue GIRL'S LIFE (featuring Patsy Walker) in 1954. 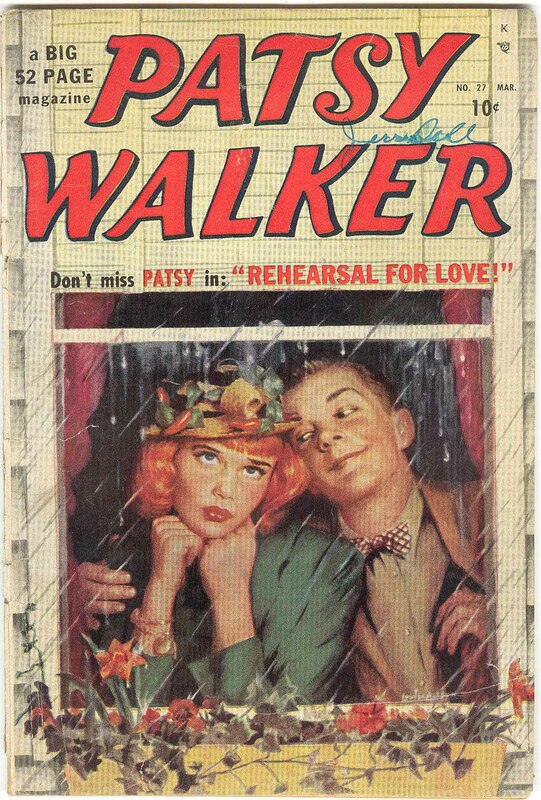 There are 4 main artistic periods to the long, 20 year, 124 issue run of PATSY WALKER COMICS from 1945 to 1965. 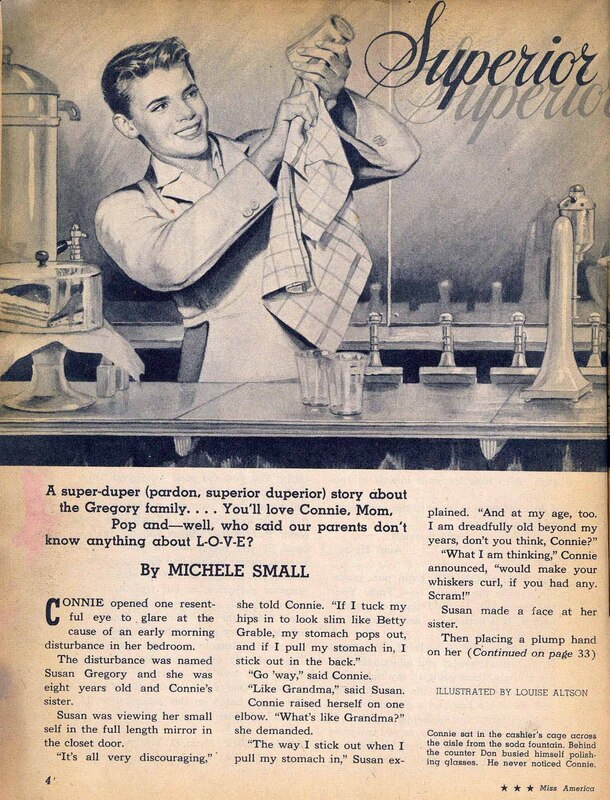 While others squeezed in stories, especially between 1 & 2 below, and there are overlaps with regard to inkers, etc., the epochs still break pretty cleanly. 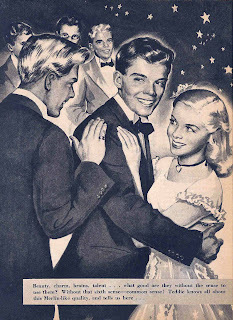 5) The Al Hartley years. Note the "A Lovers Magazine" heart-shaped colophon on this cover. 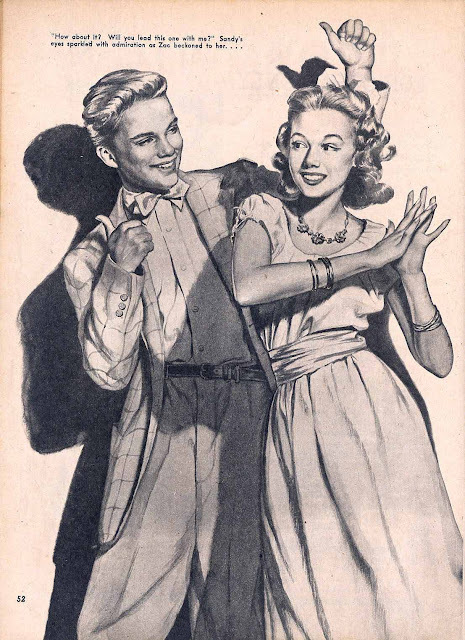 This appeared on the cover of all/most of the Timely romance glut issues of 1949-1950. Was Timely trying to pass this title as a romance title? 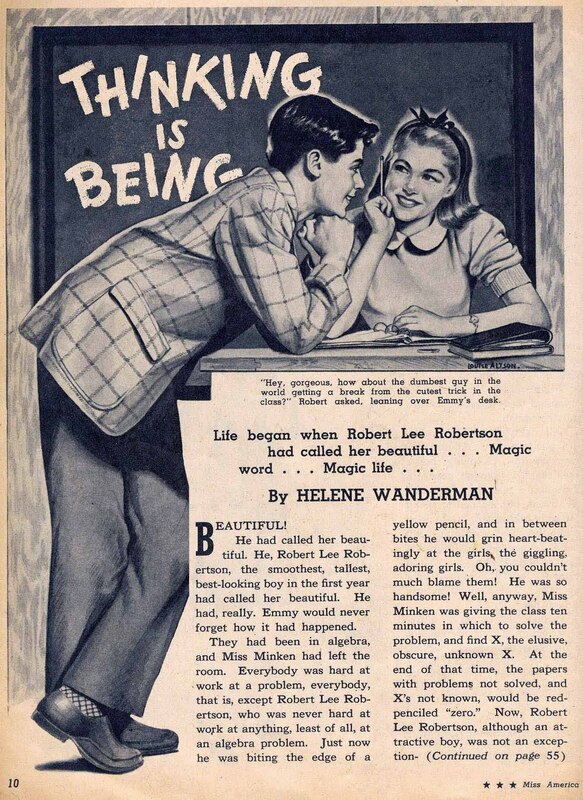 A quick look inside would have burst that bubble. This cover is unsigned but it certainly is Louise Altson. Her signature is most likely hidden under the band of copy at the bottom. 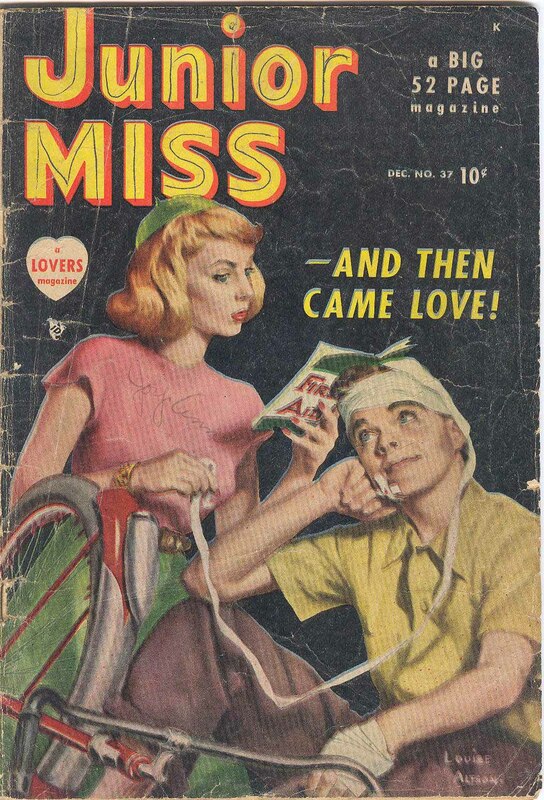 This cover is also unsigned but is definitely Louise Altson. The signature is, again, likely cut off at the bottom. 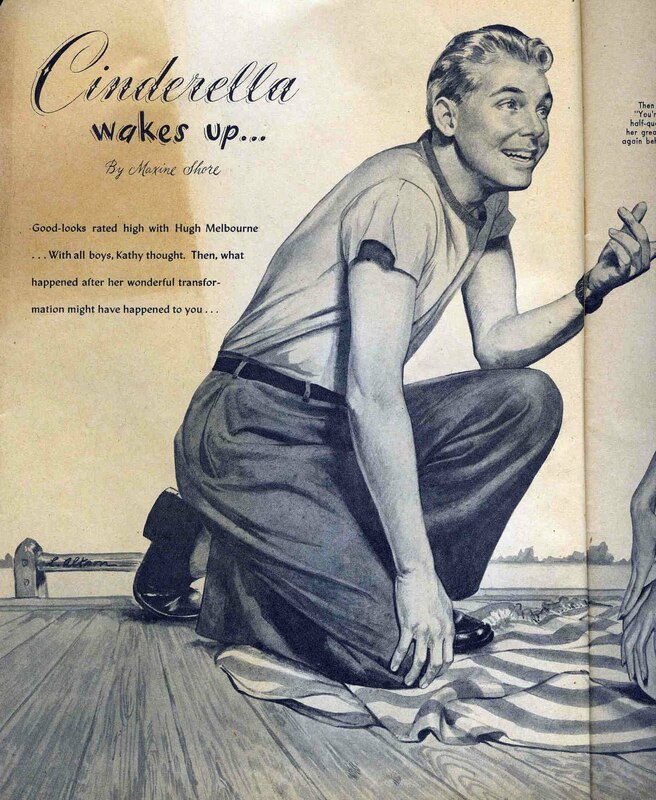 Like issue #25 above, you can see Altson's signature 80% cut-off at the bottom. We now move on to a pair of final covers. 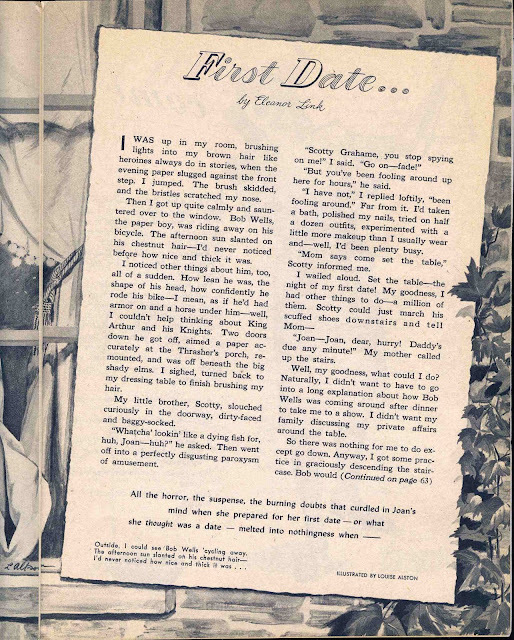 The first is MITZI'S ROMANCES #10 (Dec/49). 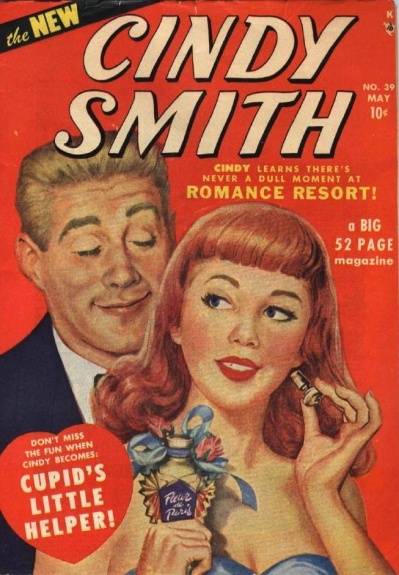 The title began as MITZI COMICS #1 (Spring/48) and changed to MITZI'S BOYFRIEND #2 through #7 (Apr/49), before finally changing to MITZI'S ROMANCES for the final 3 issues #8-10. In spite of the romantic painted cover below and the "A Lovers Magazine" heart shaped colophon, Mitzi was a teen humor title and not a romance comic. 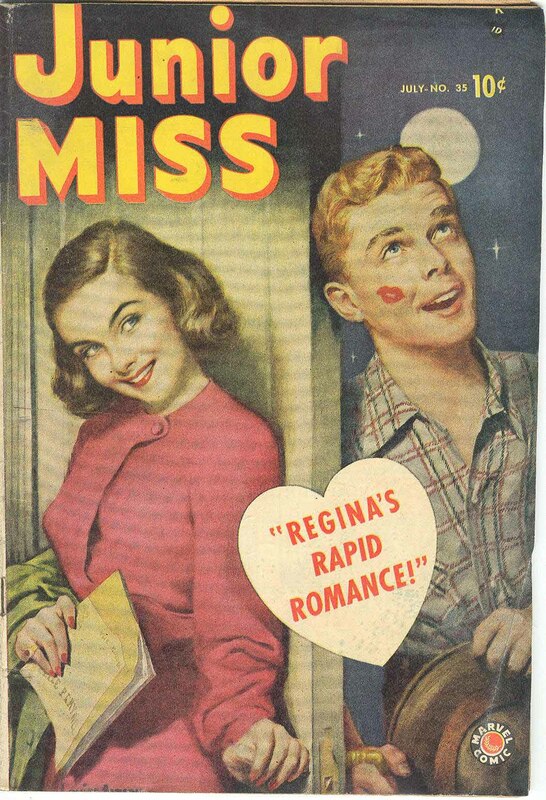 This issue below has Mitzi stories written by Stan Lee and they are classic teen-humor in the Archie, Patsy, Millie mold. 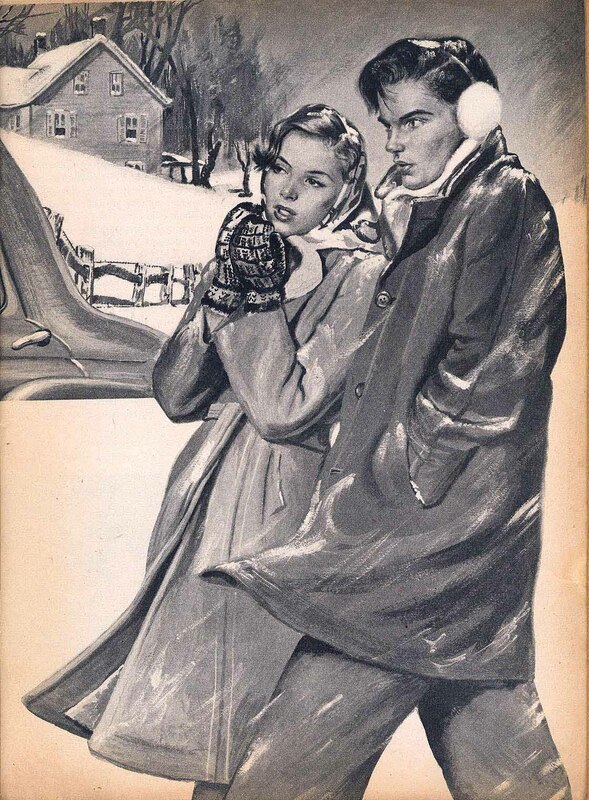 There is no signature on the cover but either it's Louise or perhaps Peter Driben's work. 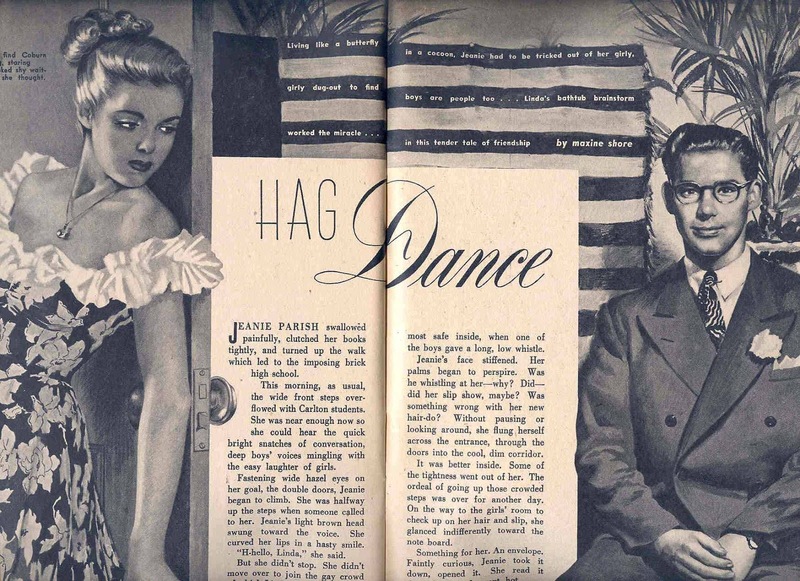 My own copy of this book is pretty ragged so I used a better image I found on Atlas Tales. MITZI'S ROMANCES #10 (Dec/49): ? (Driben or Altson) ? And lastly, CINDY SMITH #39 (May/50). 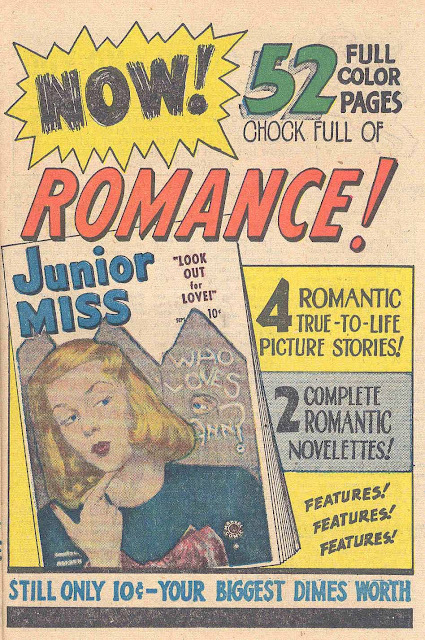 The character made her debut in JUNIOR MISS #24 (Apr/47), the sister publication to MISS AMERICA, begun during the time Stan Lee helmed both titles, the latter starting with Vol 7, #1 (May/47). 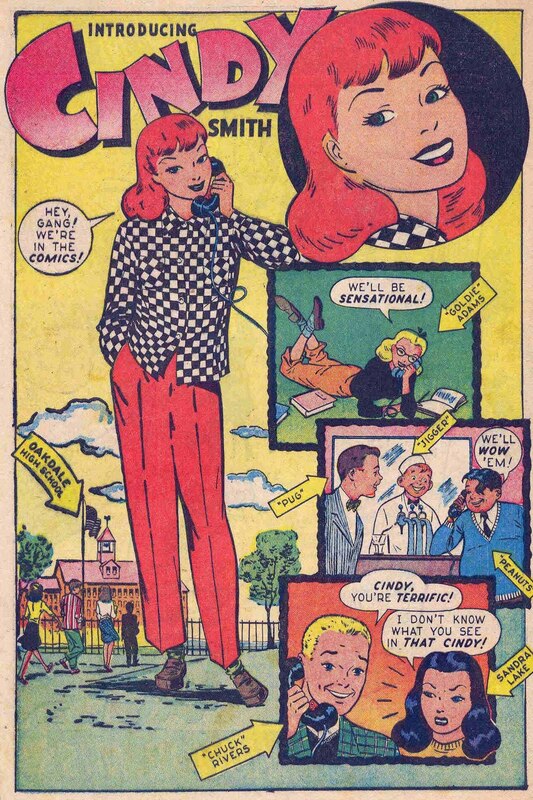 Cindy's debut (and most of her ongoing adventures) were penciled by Ken Bald and she appeared from #24 through #36 (seen above with a cover by Louise Altson). 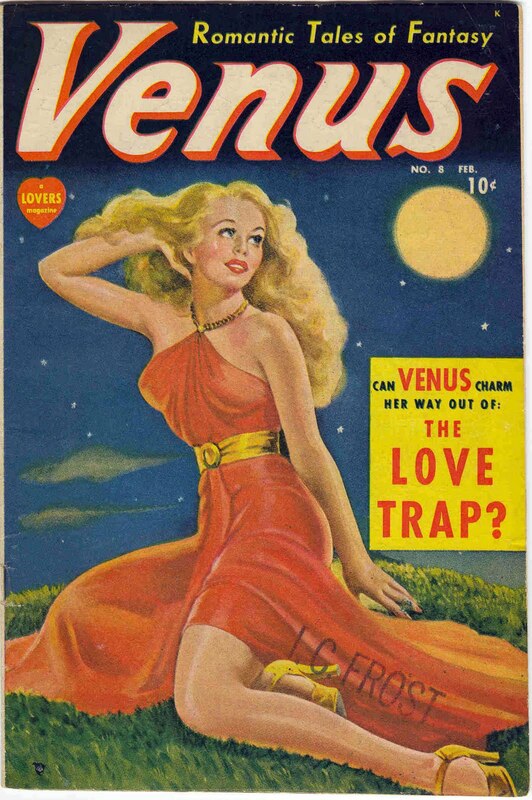 She also received her "own" concurrent ongoing title that lasted 14 issues from #27 (Fall/47, continuing the numbering of KRAZY KOMICS #26) to #40 (July/50). 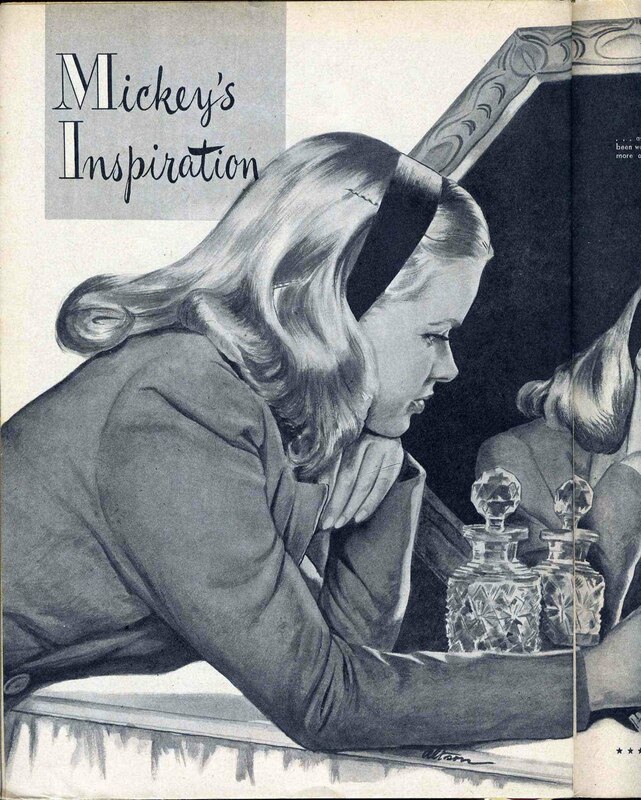 CINDY SMITH #39 (May/50): ? 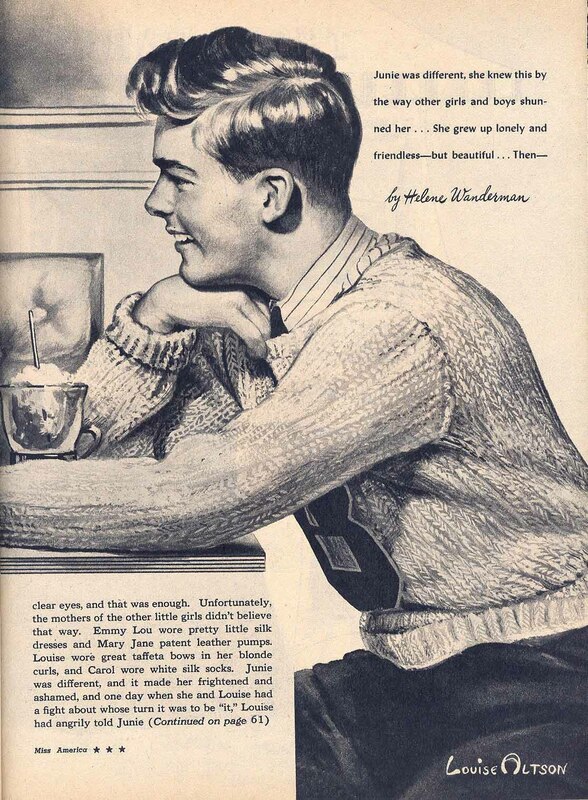 (Driben or Altson) ? 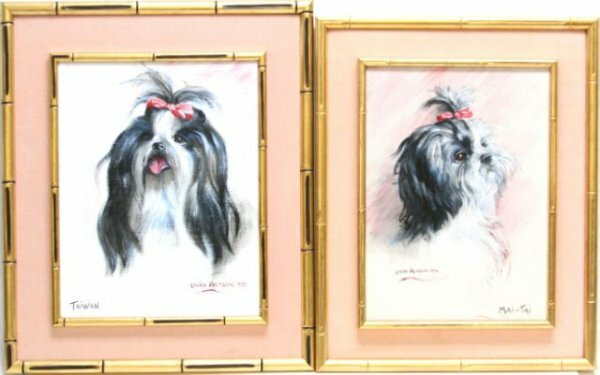 No signature again but possibly Louise Altson or Peter Driben. There are three additional unsigned Timely painted covers from this same time period and none have ever been attributed to Louise Altson. I'll show them all below for completion's sake. 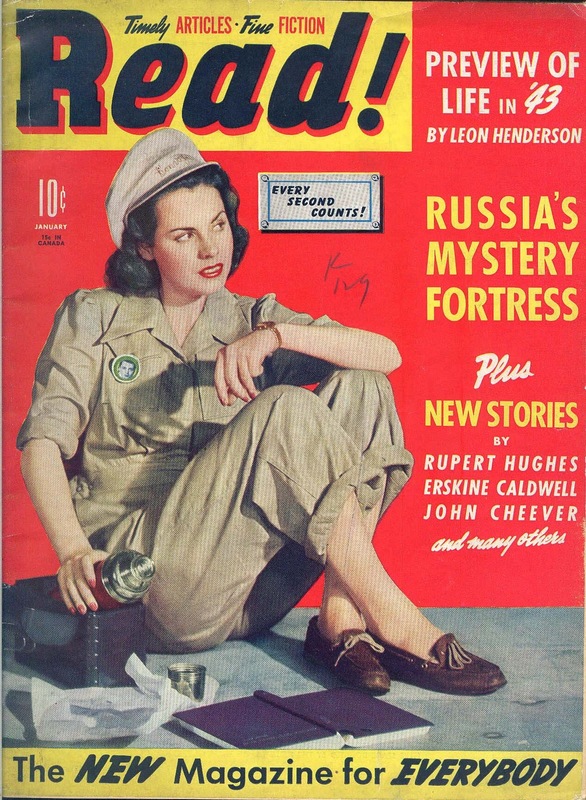 This cover is unsigned and not Louise Altson. 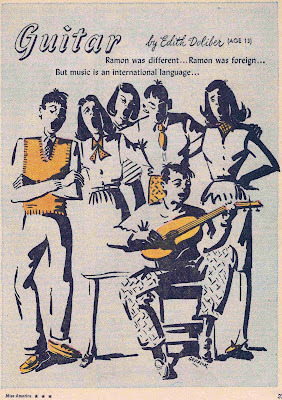 Again unsigned.Most likely Peter Driben. 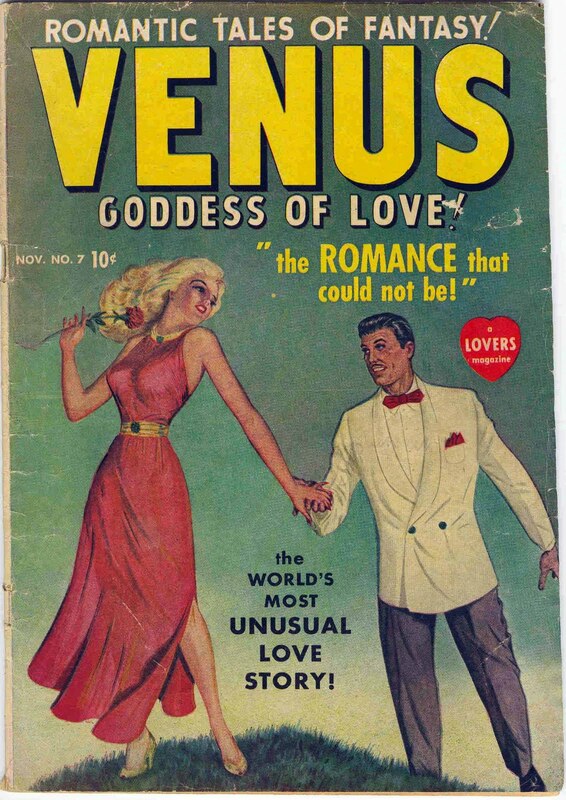 Same month as the above VENUS #8. My copy is unsigned but I found a different copy that "is" signed. 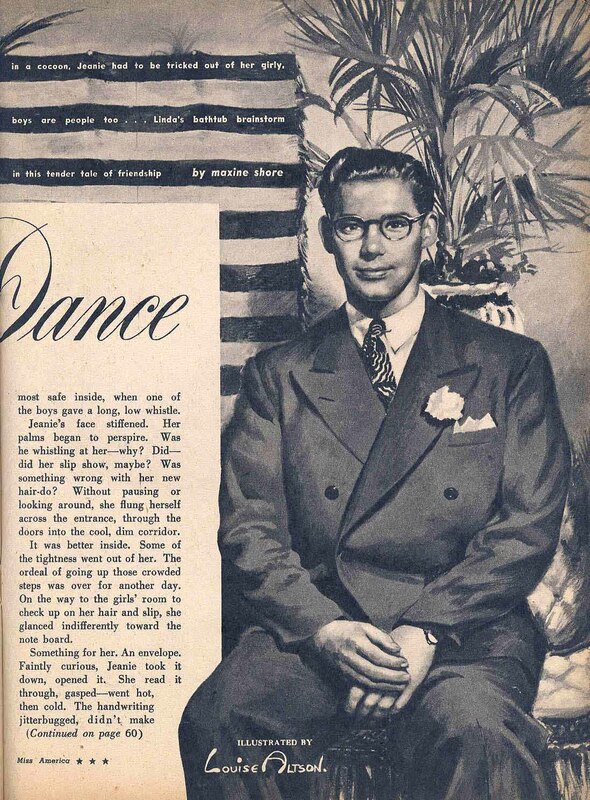 It's Peter Driben. 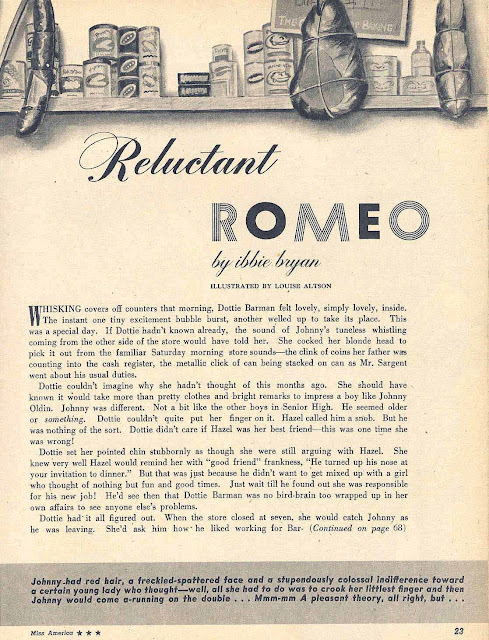 This copy below has been recently located that sports an actual Peter Driben signature not visible on the above copy. 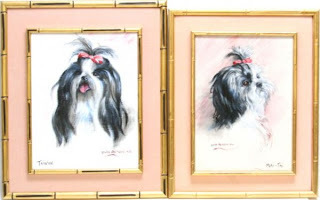 Gilstrap, Kathleen, "Artist Finds Painting a Passion", Palm Beach Post, July 25, 1987. All photographs except where indicated are courtesy and © the family of Louise Altson. List of book cover paintings courtesy the family of Louise Altson.